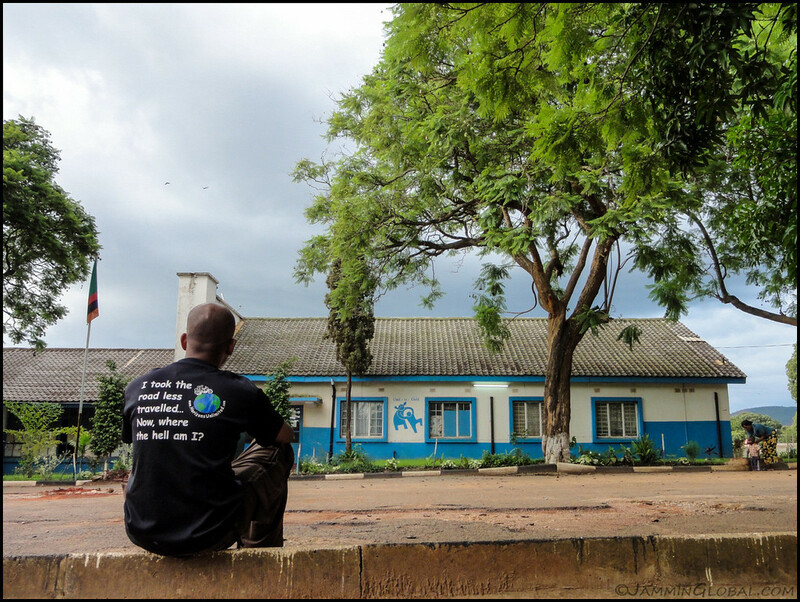 As I made my way west across Zambia, I had come to my final destination of Livingstone. 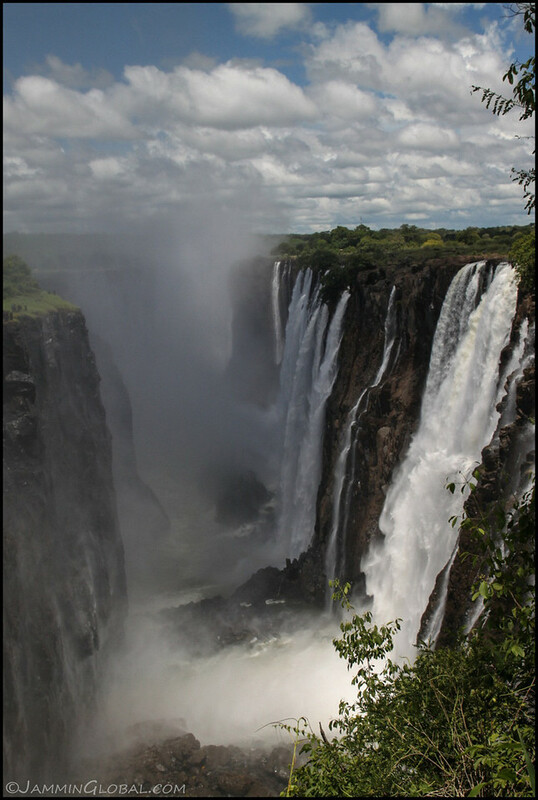 And here lies one of the greatest natural wonders of the world, Victoria Falls, the longest curtain of water in the world. I remembered coming here as a kid and as much as being a natural wonder visit, it was also a nostalgic visit. 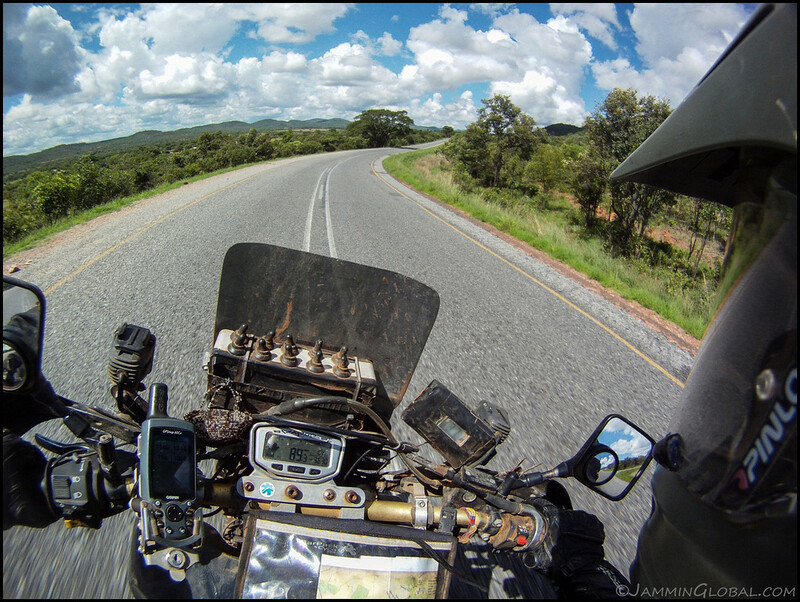 I stayed with an American rider friend who was part of a mission and he had been following my trip and saw that sanDRina had some serious cracks in her frame and offered to weld her up properly before I headed into Namibia. It also happened to be new years and I welcomed 2013 in style. Victoria Falls! Wow, what a sight. 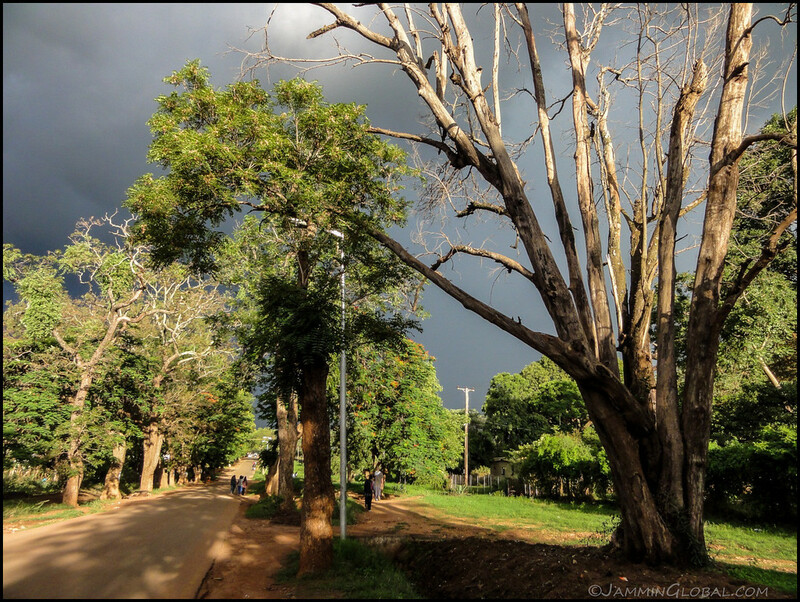 It’s also known by its indigenous name of Mosi-oa-Tunya, which in the Zambian language of Tonga translates to the Smoke that Thunders. In full flow (from February to May), the mist from the falls can be see from kilometers away and the rumble can be heard as it spreads over this generally flat land. 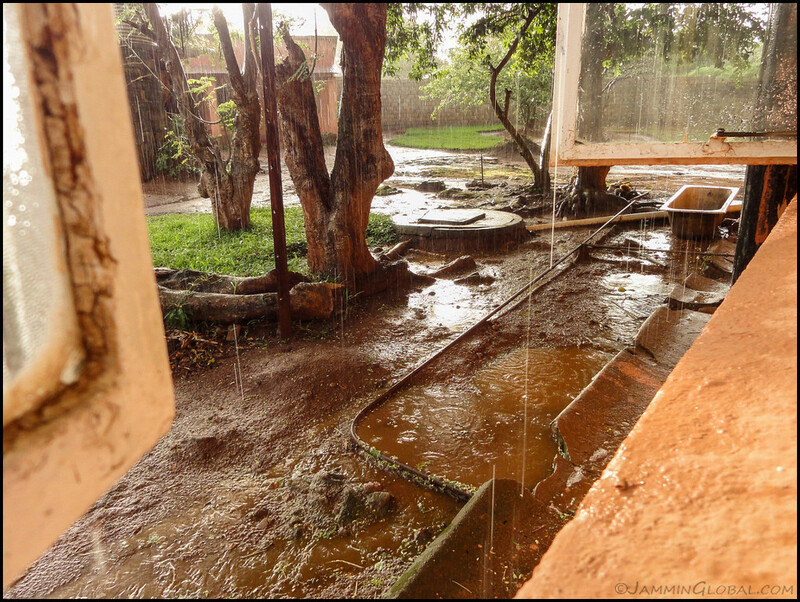 The thundering power of water. It’s not the highest (Angel Falls), widest (Iguazu Falls) or even fastest flowing (Niagara Falls) but Victoria Falls is considered the largest falls in the world. 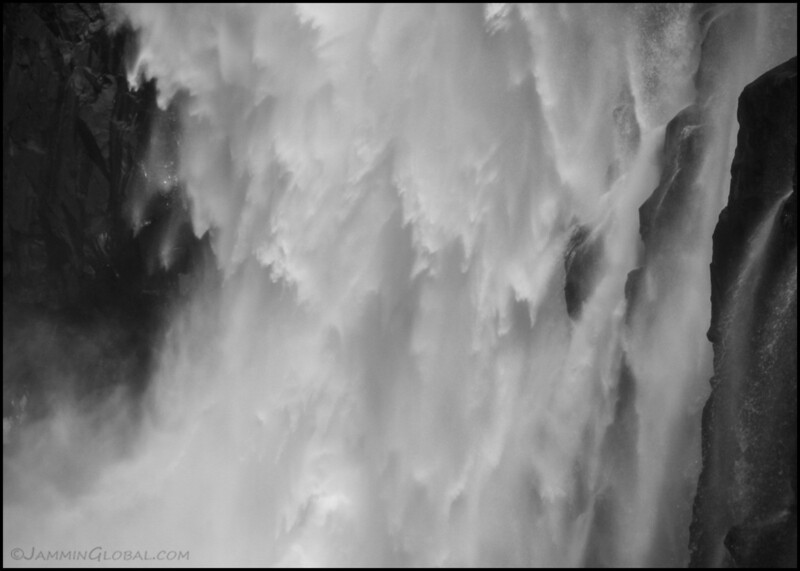 In full flow, the water flows over the edge in an uninterrupted sheet more than a mile across (1,708 m, 5,604 ft). I don’t care much for comparisons as each mega falls is awe-inspiring on its own. There’s something about being so close to massive amounts of water free-falling. 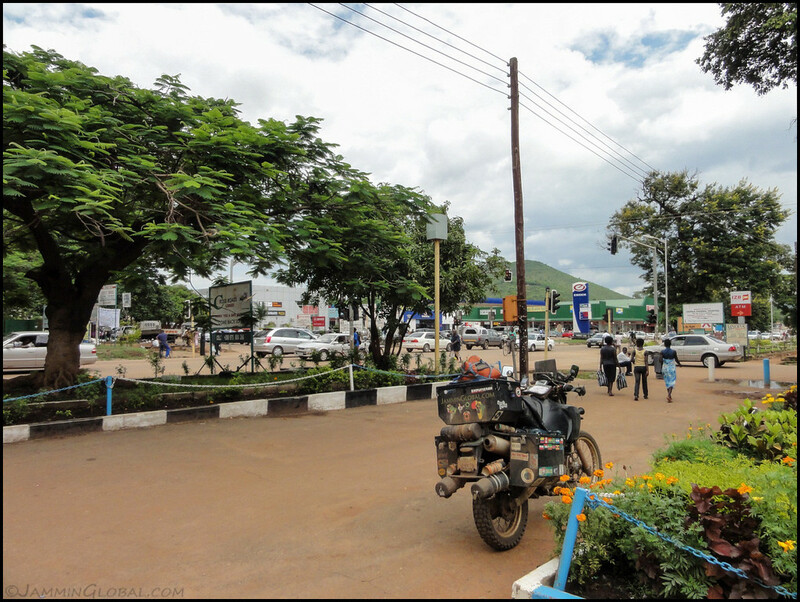 After the nostalgic visit to Chipata, I turned around and headed west. I spent a night along the banks of Luangwa River and then got to Lusaka where I had a special appointment with a girl child. 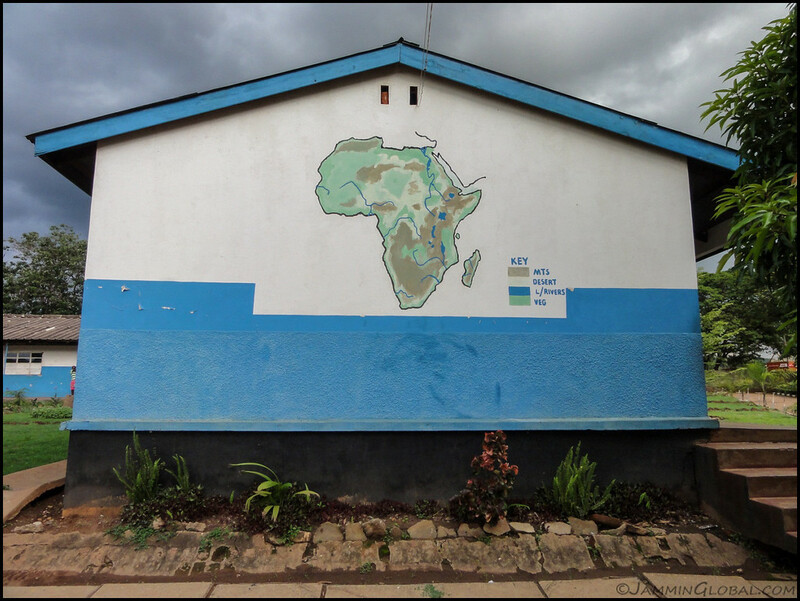 From Chipata, on the eastern edge of Zambia, it was 570 km (354 mi) to Lusaka, the capital. I had been driven on this road many times as a kid in old Land Cruisers and this would be the first time that I was journeying on it myself. 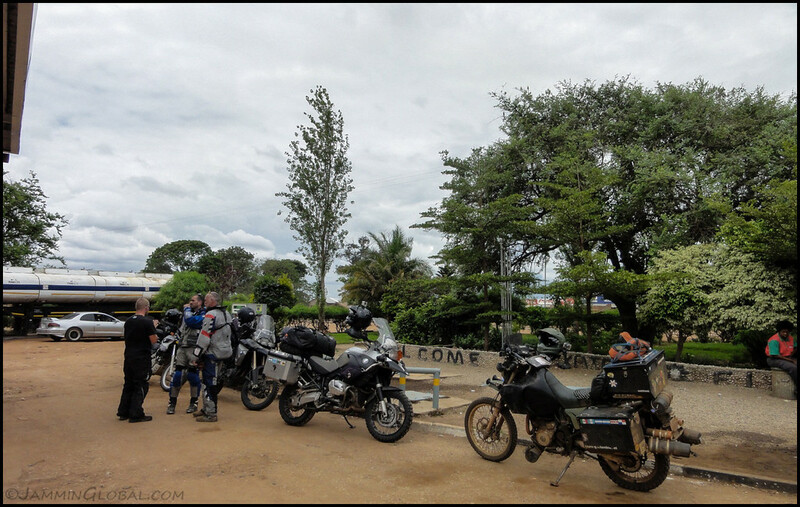 At the junction town of Katete, I ran into these motorcycle travelers from South Africa on BMW R1200GSs, the mac daddy of adventure bikes. They were making a loop of Southern Africa. They had blasted up Namibia, across Zambia and after hitting the beaches in Malawi, they planned to blast down Mozambique before getting home. A panoramic view of the lush hills of Zambia. 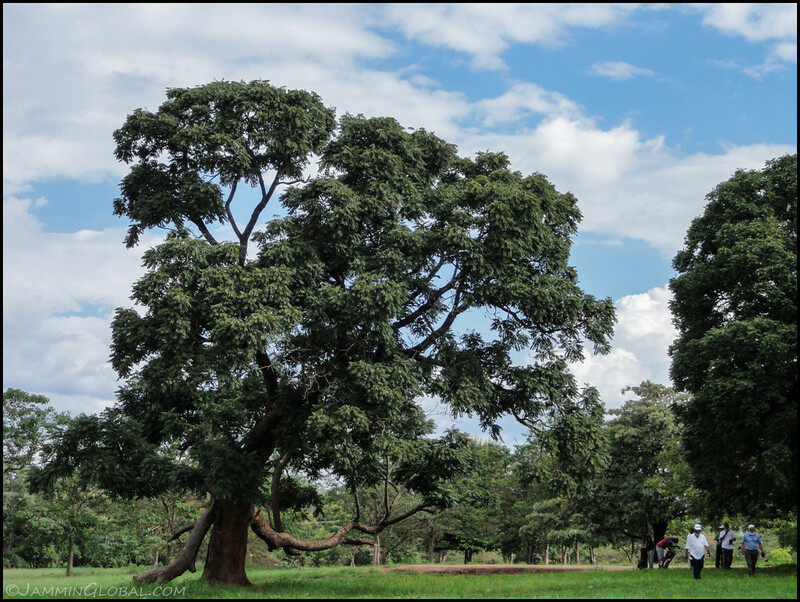 That’s one good thing about being in a country during the rainy season; the landscape is verdant. 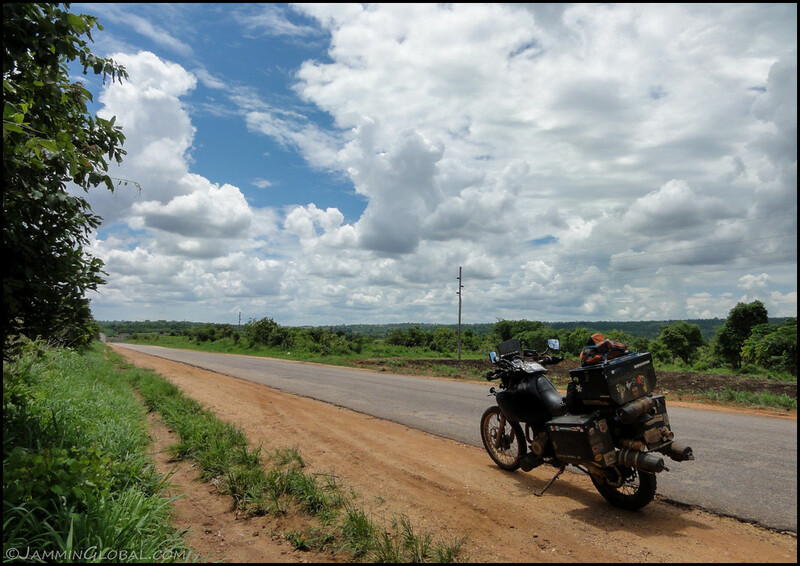 As I got near the halfway point of the route to Lusaka, to the Luangwa River Valley, the terrain became more hilly and with the excellent roads, it made for fun riding. Being the rainy season, wild mushrooms were available everywhere. 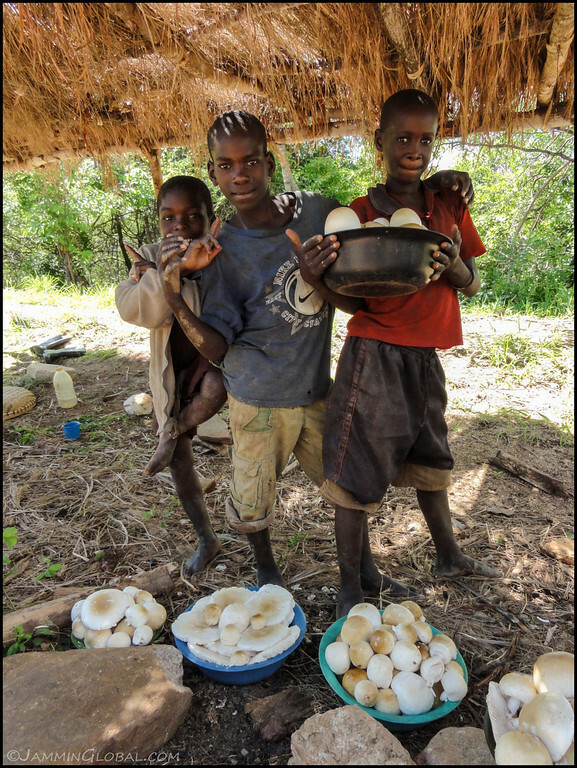 These boys were trying to sell me a whole bucket but I told them I was just cooking for myself that night with a small pot and managed to buy just a few large, fresh mushrooms. The halfway marker on the Chipata to Lusaka Highway is the bridge over Luangwa River but being a national strategic asset, it’s guarded by the military and no photos are allowed. I remembered crossing this bridge many times during my childhood trips. 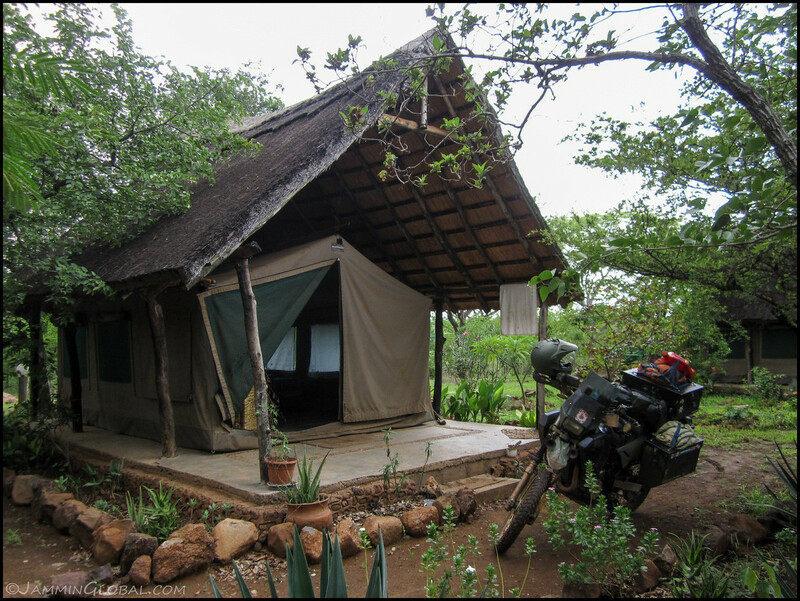 Right next to the bridge is the aptly named Bridge Camp that overlooks Luangwa River. 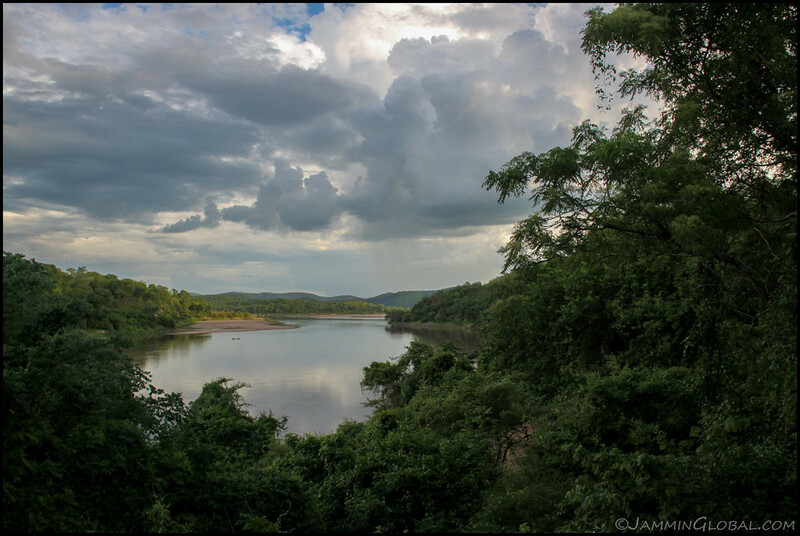 The Luangwa River, flowing from the northeast of Zambia through the wildlife parks of North and South Luangwa National Park and connecting to the Zambezi at the Zimbabwean border. 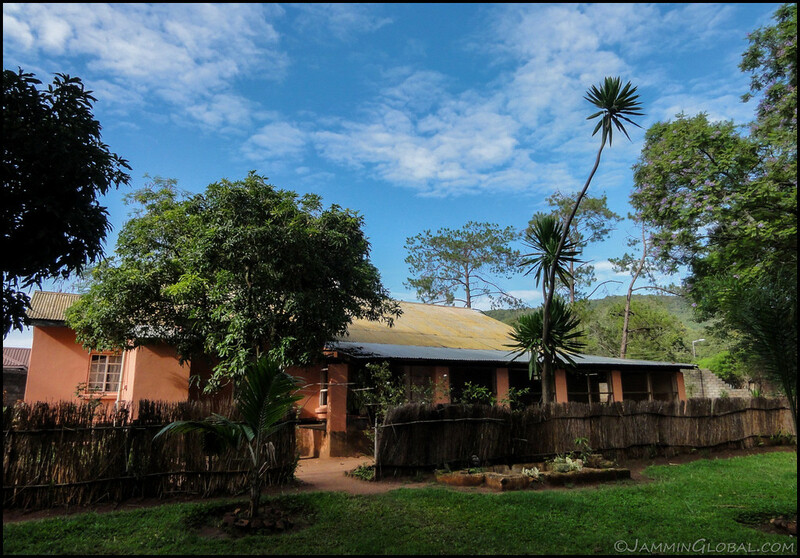 When living in Chipata, our family used to visit South Luangwa NP quite frequently and now, it’s being heralded as a hidden gem of Africa, compared to the limelight that the Serengeti, Maasi Mara and Kruger NP get. I hope it stays that way and keeps Zambia a bit off-the-radar. 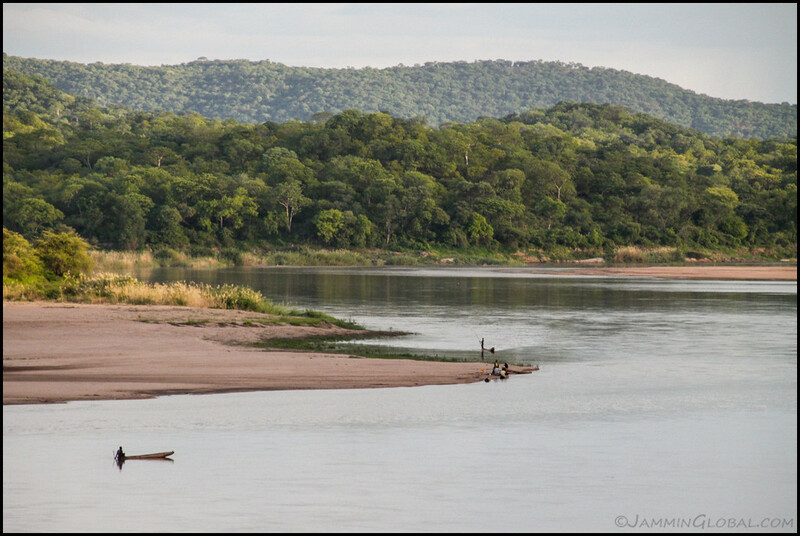 A panorama from Bridge Camp of the passing Luangwa River. 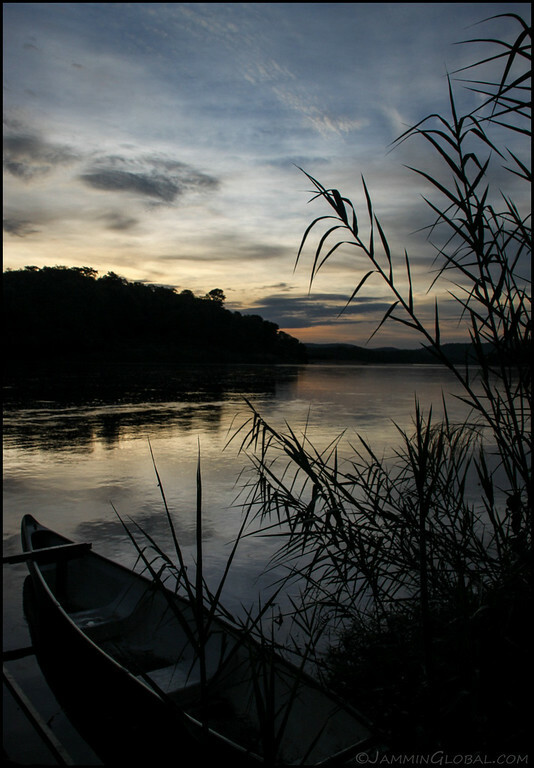 Morning sunrise from the banks of the Luangwa River. 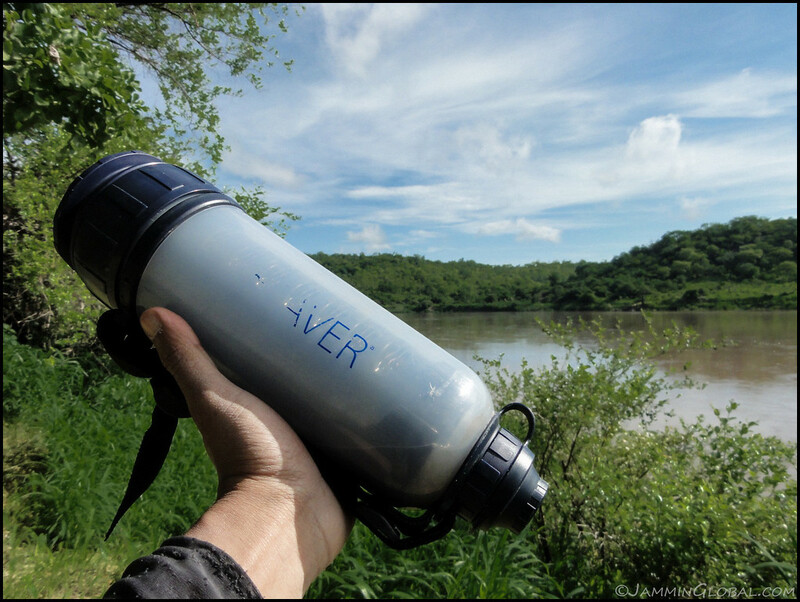 Filling up my LifeSaver water filter with juice from the Luangwa River. It tasted of sweet childhood memories. Further up in South Luangwa National Park, I saw my first lions and elephants in the wild before seeing them in a zoo and thank Zambia for providing me with a fantastic childhood. 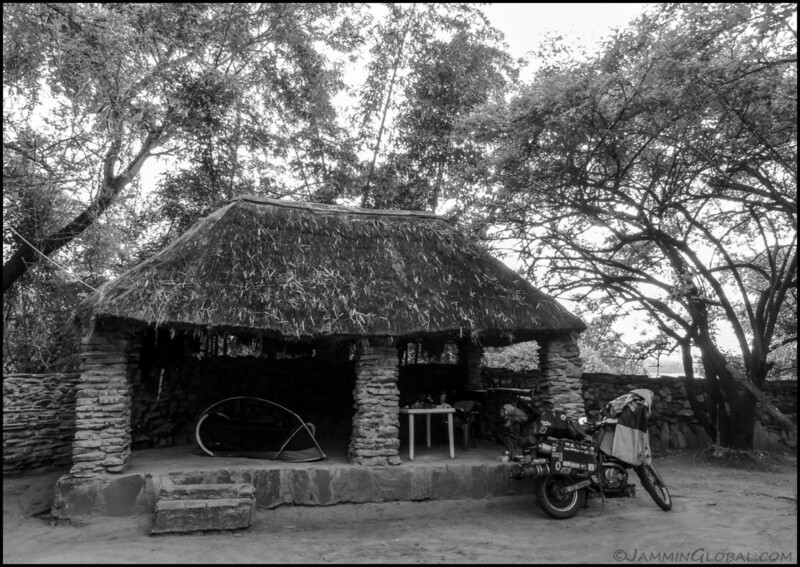 Bridge Camp was empty during my stay as it was the low season and I set up my tent at the cooking pavilion where I made a tasty mushroom and rice dish. A few kilometers of off-road getting back to the highway. I didn’t get the chance to explore Zambia much as I was on a schedule for my South African visa that was already counting down to expiry. Riding the wonderful twists and turns and enjoying leaning sanDRina at a good speed. She’s a heavy bike, laden with all my stuff, but she’s still very well balanced and a true dual sport; handling almost anything off-road and a joy on-road. 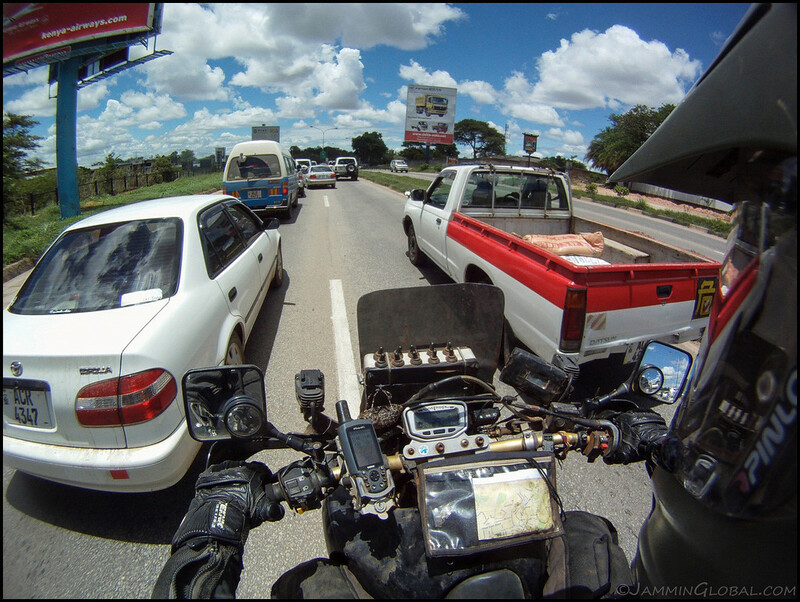 Entering Lusaka and lane-splitting in traffic. I love riding out in the open but I also get some kicks riding in dense cities. If you think this is scary or dangerous, trust me, I’m a professional. 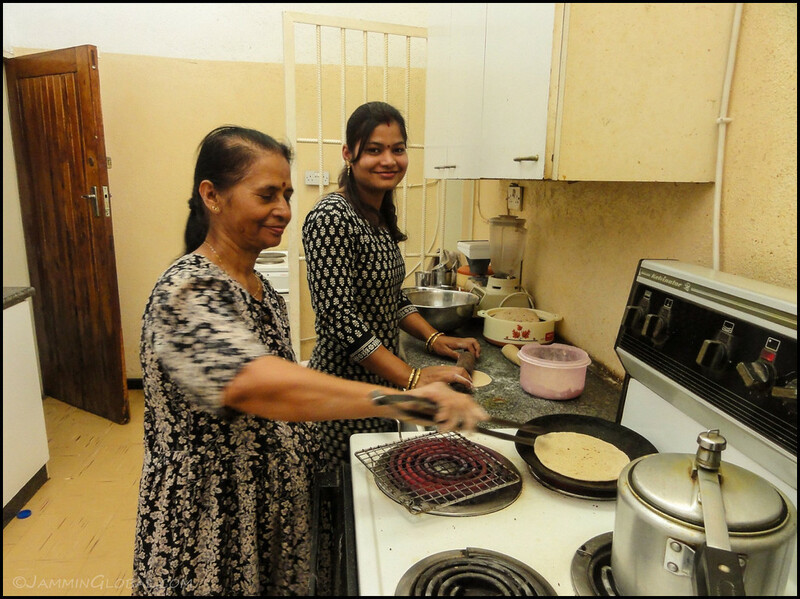 Staying with an Indian family in Lusaka whom my parents knew and Verma Aunty is making some fresh rotis. 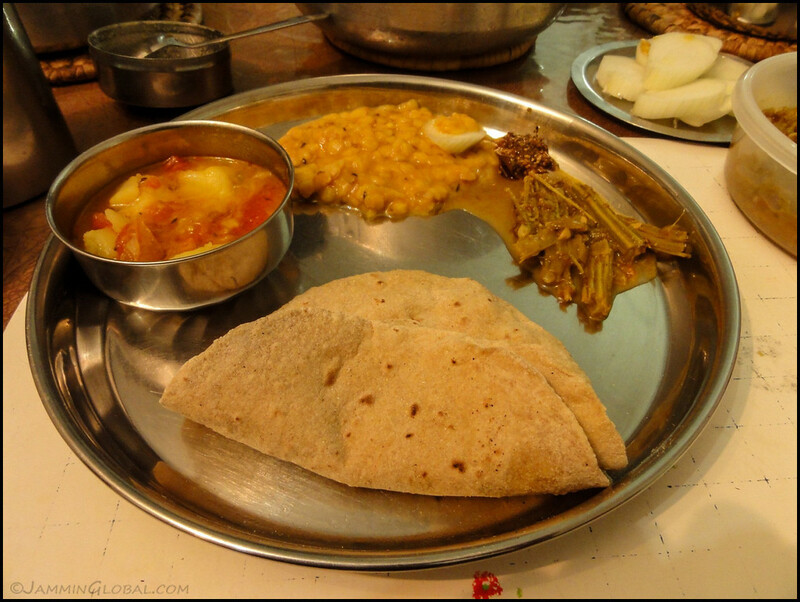 Simple Indian homefood of rotis, dahl, aloo subzi (potato) and drumstick curry. Drumstick is one of my favorite Indian vegetables and it’s grown locally here just for the large Indian population, who have been in Zambia for over a hundred years. 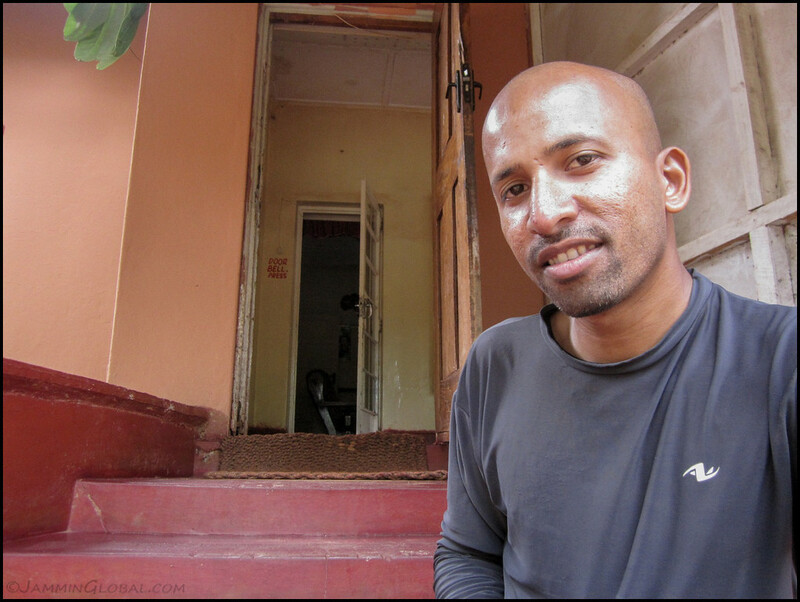 Unlike Indian migrants who went to South Africa or other parts of Africa, Indians who came to Zambia, or Northern Rhodesia as it was known before independence, most of them were not indentured laborers but artisans and businesspeople. And also unlike the uneasy relations between Indians and the local citizens, such as in Uganda in the 70s, Zambian has had a good relation with its Indian community and maybe that’s why so many Indian families came and stayed here. 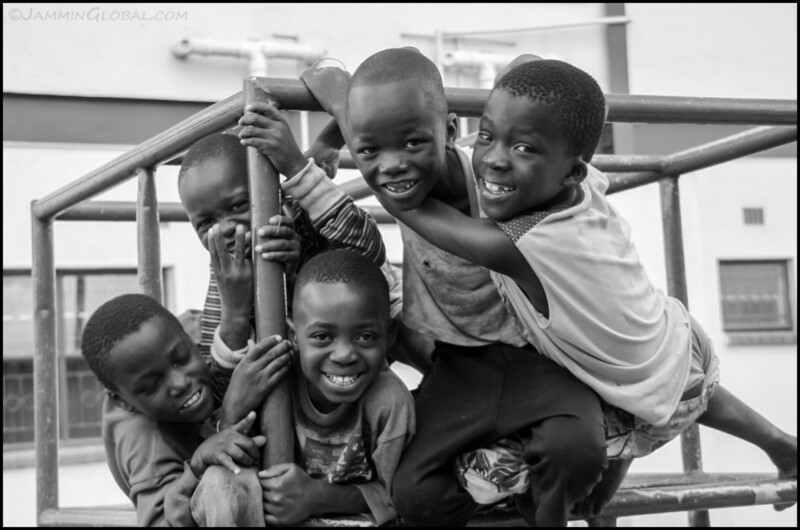 One of the main reasons I came to Lusaka was to visit the local Children International Centre. I had been sponsoring a child with them for the past few years and for $22 a month (of which 80% goes to the child), they lift one child out of poverty and give them a solid start to life by providing education, nutrition and guidance. 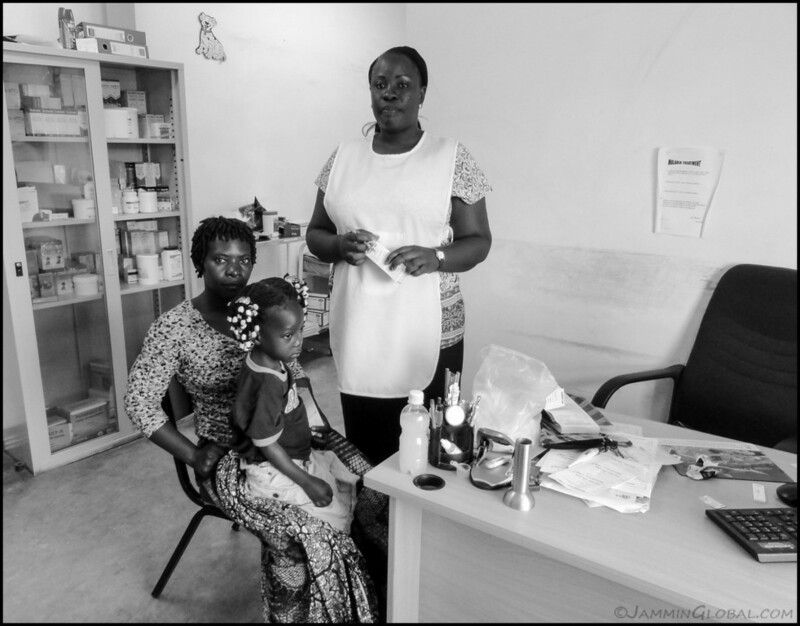 Getting a tour of the Children Intl Centre and one of the main benefits of the program is a dedicated clinic that ensures child and mother are in optimal health. There’s also a library and a school at the facility. 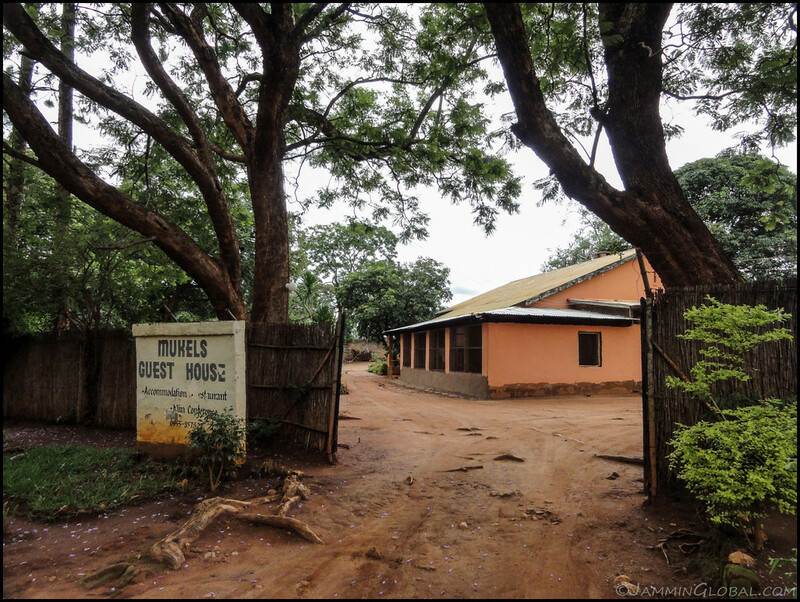 Children Intl has centres in India, Latin America and Zambia and I chose the centre here because I wanted to give back to the fantastic childhood that Zambia gave me. 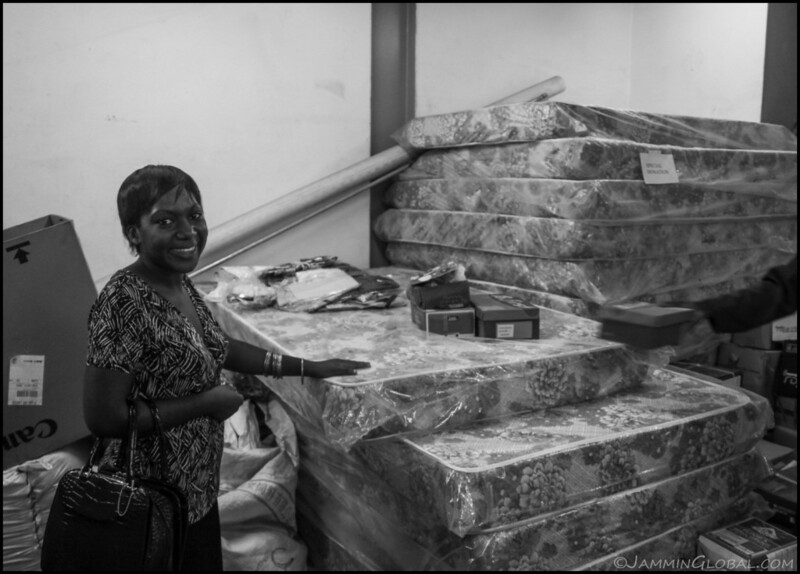 Joan, the officer from the Children Intl Centre in Lusaka showing me the mattresses that each kid gets every year. 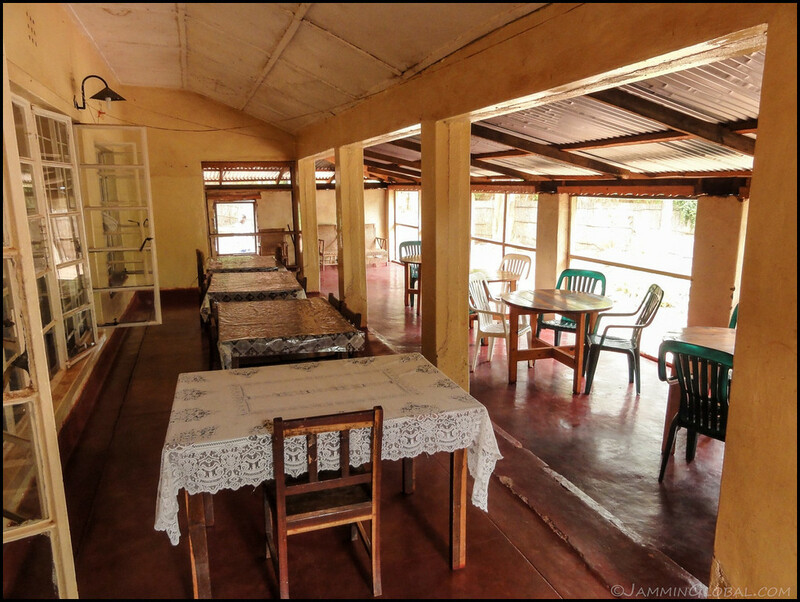 They also receive regular gifts such as clothes and utensils that the family can benefit from. 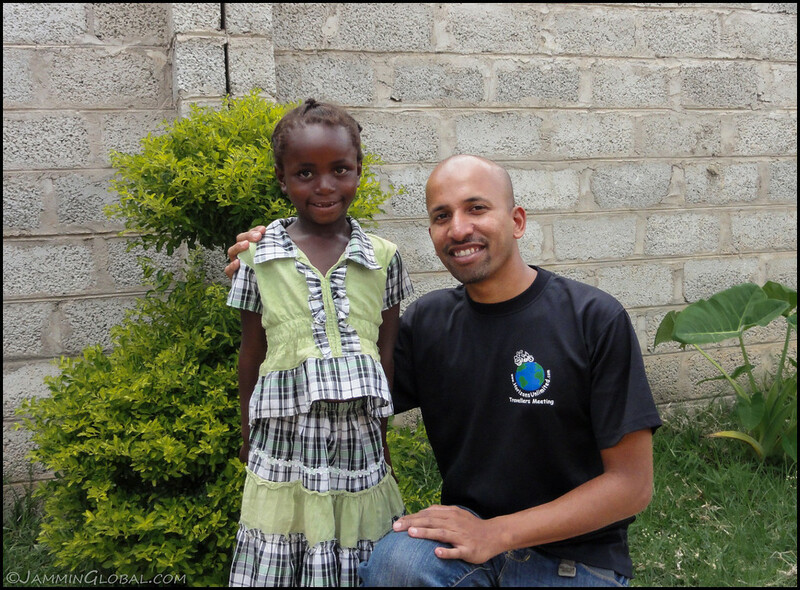 Meeting my sponsored child, Abigail! She was 7 years old and I don’t know if she understood what was going on but she seemed like a smart girl with a good head on her. When I was a kid, my nick name was Abi and it was a strong moment when Abigail’s mother referred to her as Abi. This was meant to be 🙂 I spent some time hanging out with Abigail and hoped she would remember this bald man who visited her once. 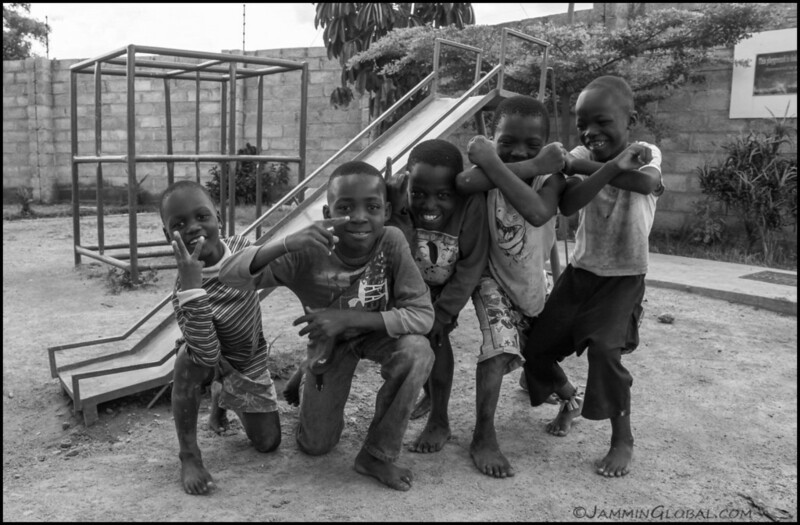 While taking pictures with Abigail, these boys really wanted their photo taken and struck up some great poses. The kid in the middle had this twinkle in his eye and I can see him going far in life. Such wonderful energy to end my visit to the Children Intl Centre. 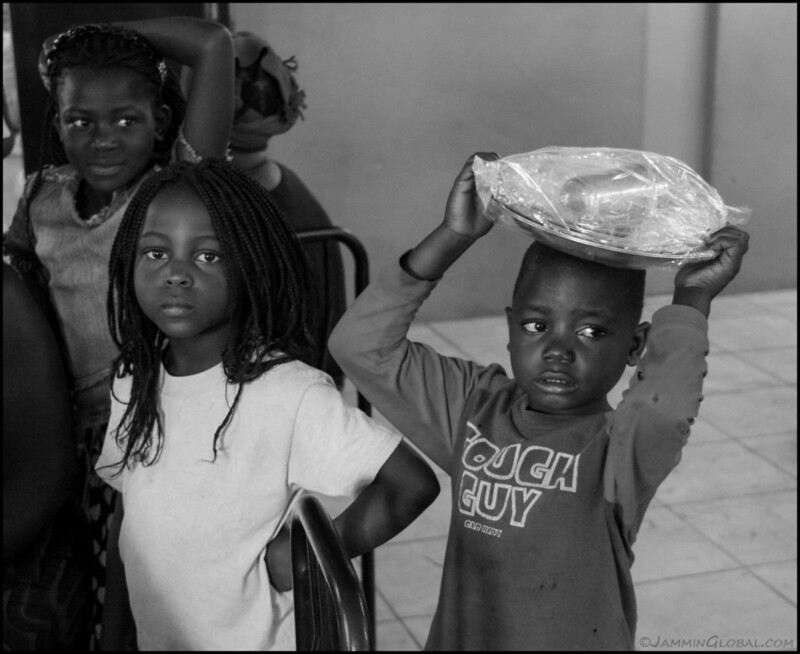 I hope these kids benefit from the program and contribute to a strong Zambia in the future. 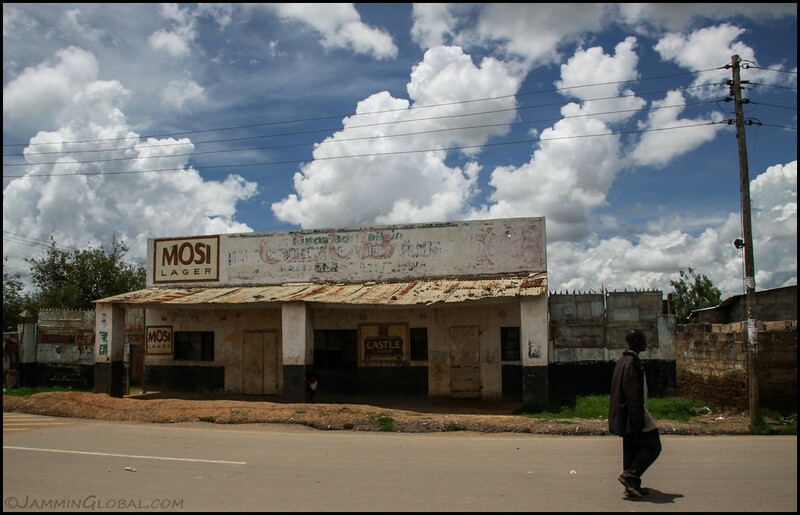 Right opposite the Children Intl Centre, a bar with Mosi Lager, the beer of Zambia. Mosi, referring to Mosi-oa-Tunya, the name for a thundering waterfalls that I was heading to next. I received my visa for Namibia and thanked Verma uncle for the stay. He is an agronomist and is an important figure in the Zambian agricultural sector. We had many interesting discussions over the few days I stayed here. Uncle told me that it’s been calculated that to feed the entire world, it would take 850,000 sq km of land and Zambia is a very fertile land and its total area is 750,000 sq km. Wow, that means we have more than enough arable land to feed everyone on the planet, yet, a billion people still go hungry every night while one and a half billion are overweight. We also discussed physics as uncle, being a biologist, never fully understood some concepts in physics and asked me to explain what e = mc2 means, which I did. 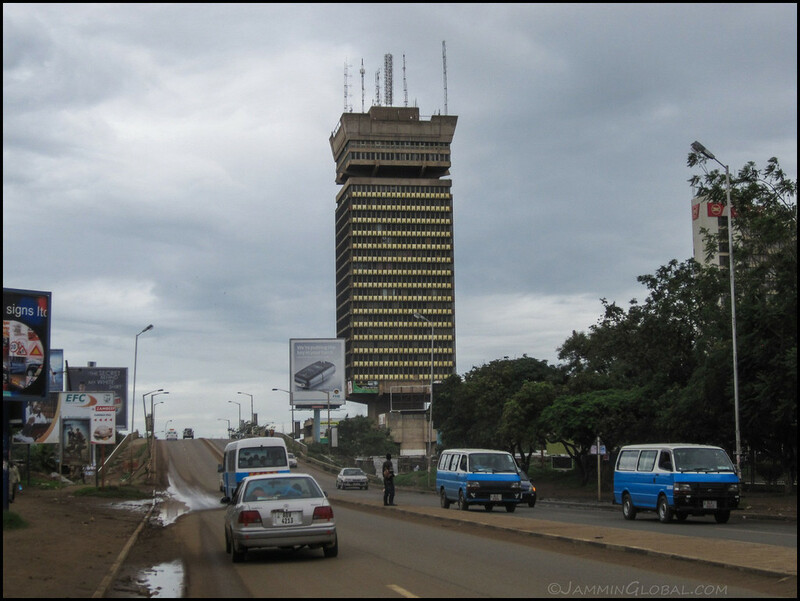 Heading out of Lusaka and I remember this iconic building, Findeco House. 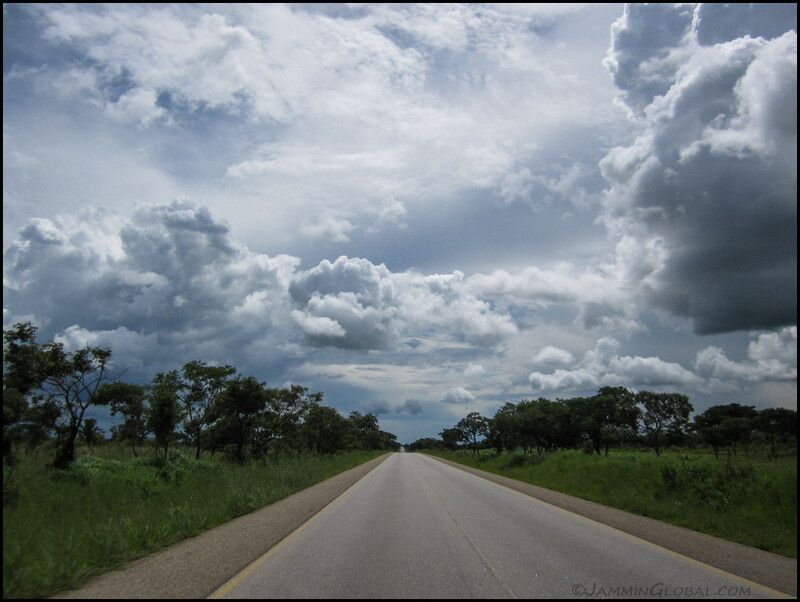 Back on the open road, heading south to Livingstone with storm clouds making for a spectacular sky. 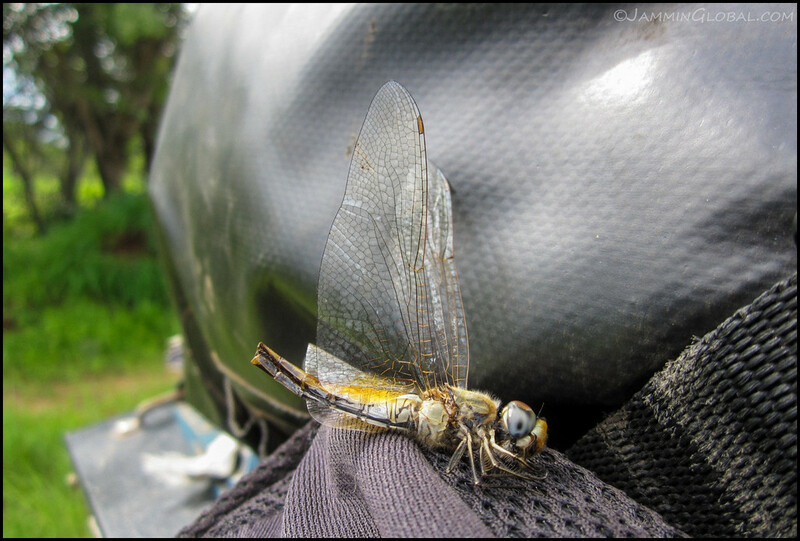 A dragonfly caught in sanDRina’s oil cooler. I remember as a kid that dragonflies were sold as a cheap protein in the market to go with nshima, the maize meal staple of Zambians. 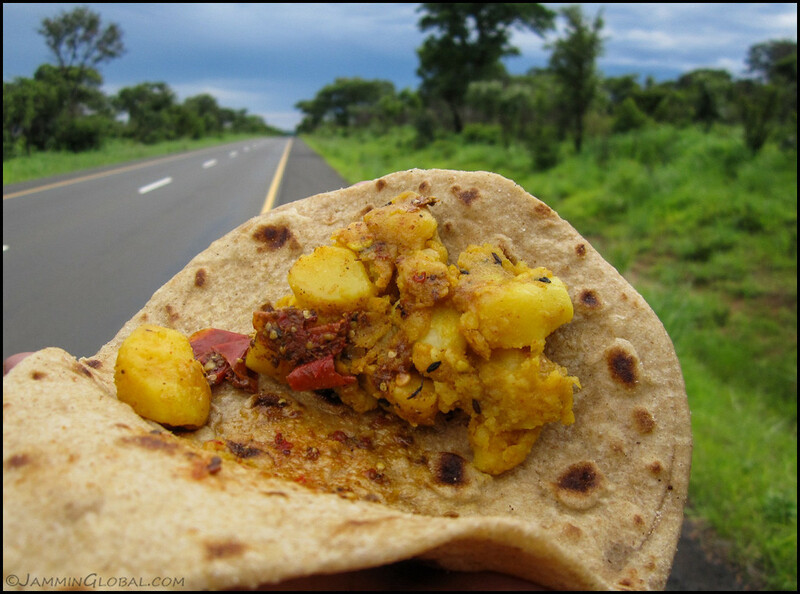 Stopping for some roadside lunch and having the staple food of north Indians, roti and aloo with some spicy achar (pickle). This would probably be my last bite of Indian food till I got to Durban in South Africa. sanDRina, my beautiful home on the road. She was hurting a bit from some serious cracks in her frame and up next was a much-needed visit to a specialist. 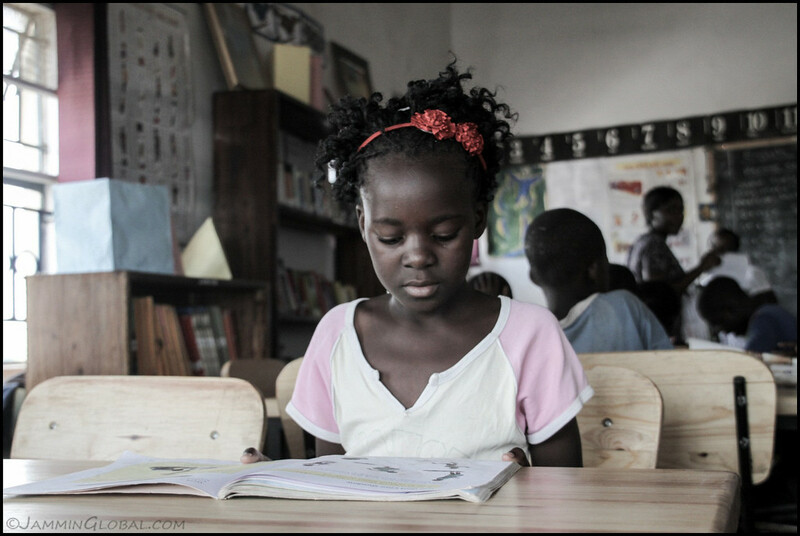 In all of Africa, one country holds special significance to me and that is, Zambia. 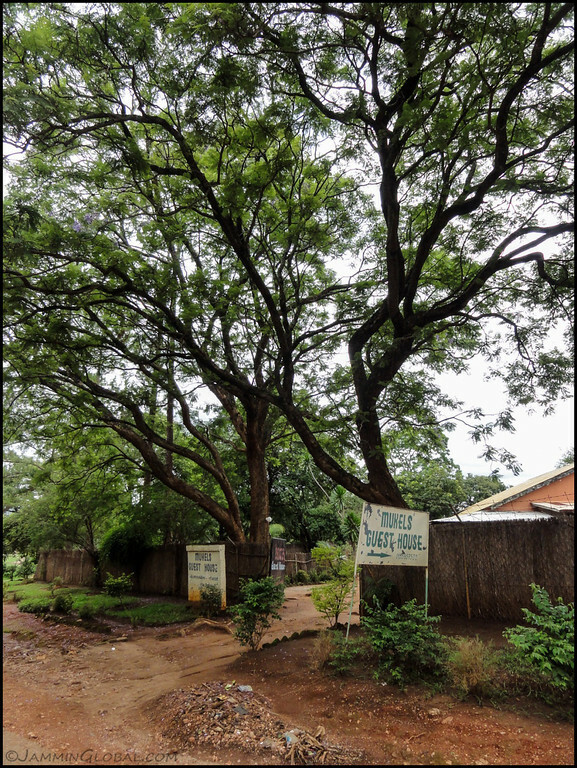 In 1983, at the age of 2, my family moved to the small town of Chipata in Eastern Zambia and we lived there for 9 years. My father, an agricultural scientist with the Food and Agriculture Organization (FAO) of the UN, was stationed at a research center near town. My family says those were the best years as life was good in Zambia. Vacations were spent on the shores of Lake Malawi and going for game drives in South Luangwa National Park. I saw lions and elephants out on the savanna before I saw them in a zoo. 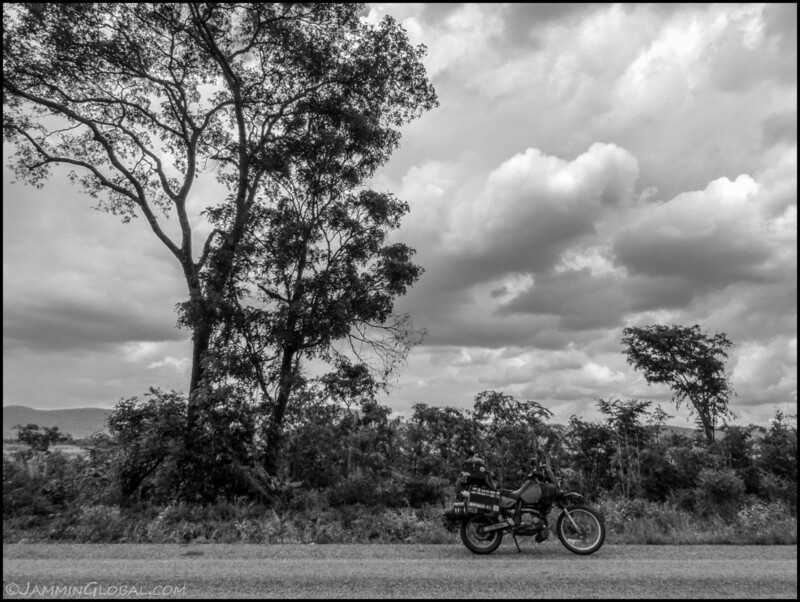 I got my first taste for road trips in rickety Land Cruisers and was crossing borders before I could even write. 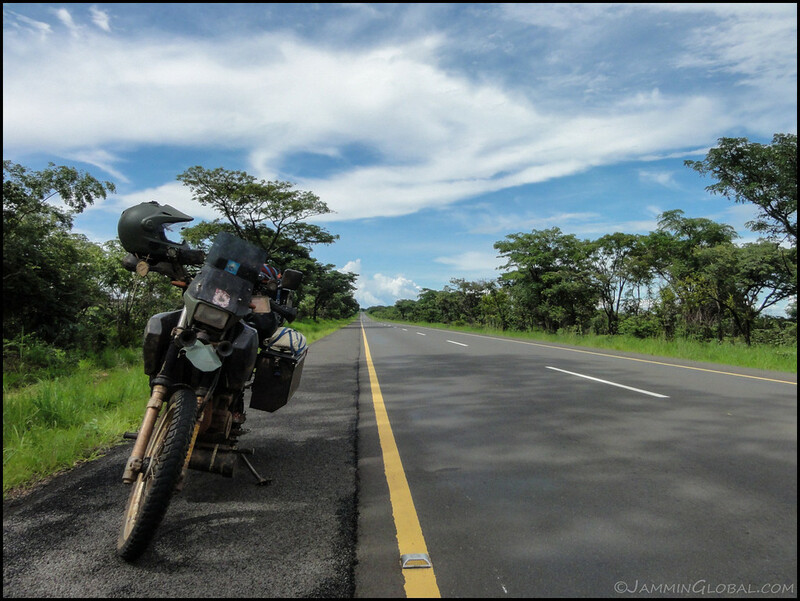 My time in Zambia is a fundamental part of who I am today and I knew I had to visit this ‘home country’ on my motorcycle journey. It wasn’t easy to come back because the visa process is extremely difficult for Indians, which was surprising considering the long relation Indians have with Zambia. 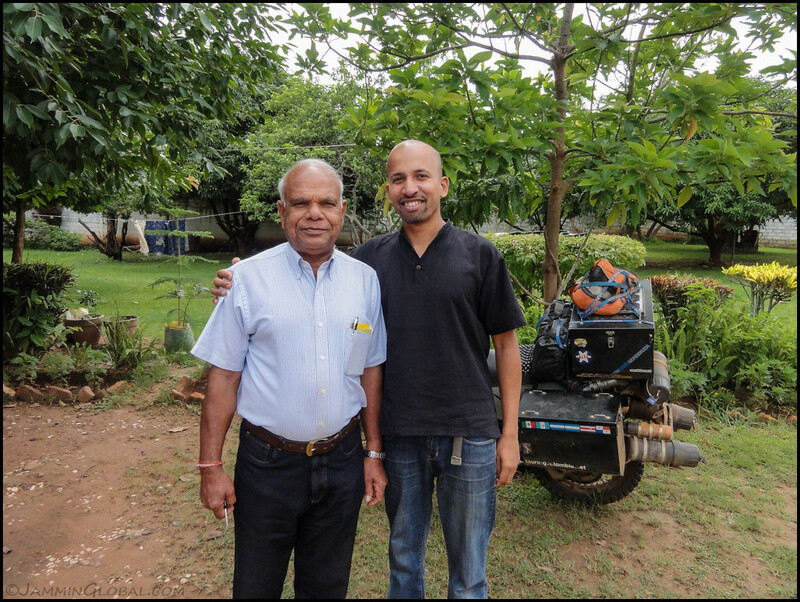 In the 1970s and 80s, there were many Indian families all around Zambia and even the provincial town of Chipata had over 50 Indian expat families, which made for fun parties. What was great was that there were many kids around the same age as my sister and I and our friends from Chipata are still all in touch, thanks to facebook. Besides the personal connection to Zambia, I wanted to revisit Victoria Falls and then connect overland to Namibia. And in Lusaka, I was looking forward to meeting the girl child that I was sponsoring for the past few years through Children International. 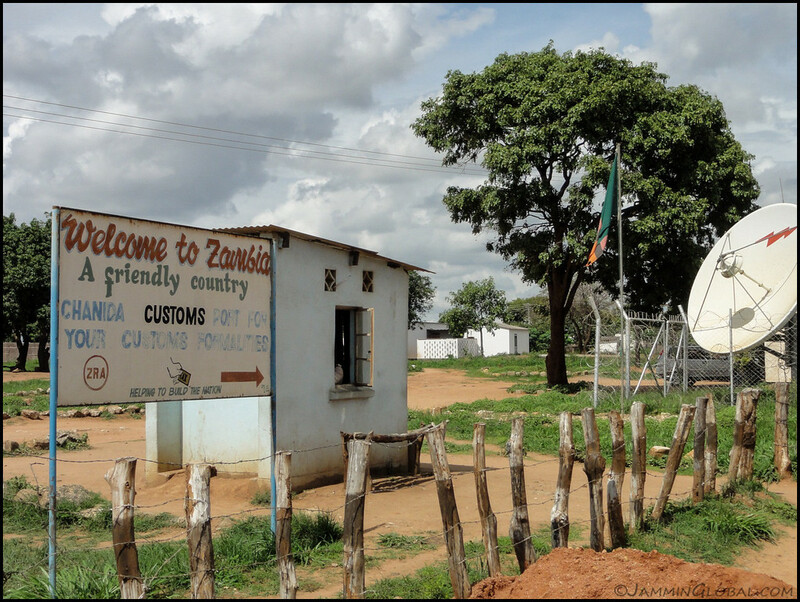 Entering Zambia at the Chanida border with Mozambique. 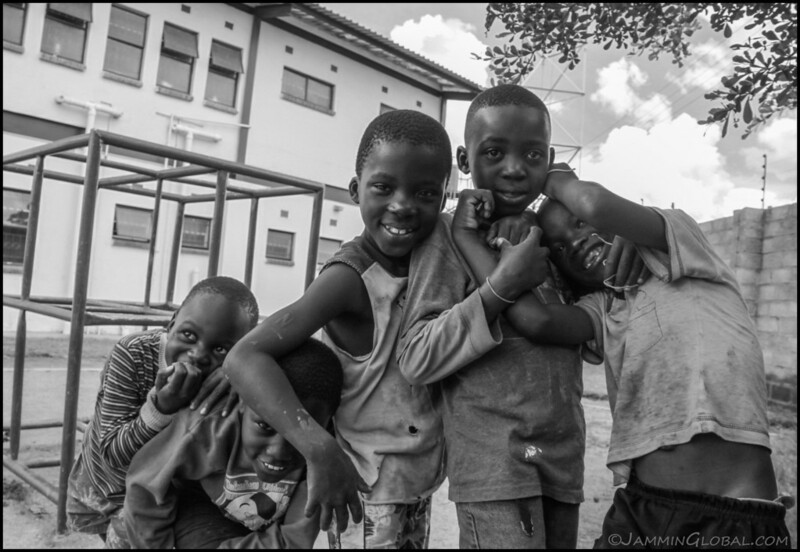 Zambians are known to be super friendly and some of that must come from the relative stability and growth the country has experienced since independence. Checking in at immigration and everything was very orderly and professional. Just a few days before I had received notice from my contact in Lusaka that my visa was approved and I presented that letter here, along with $50 and was welcomed back home. 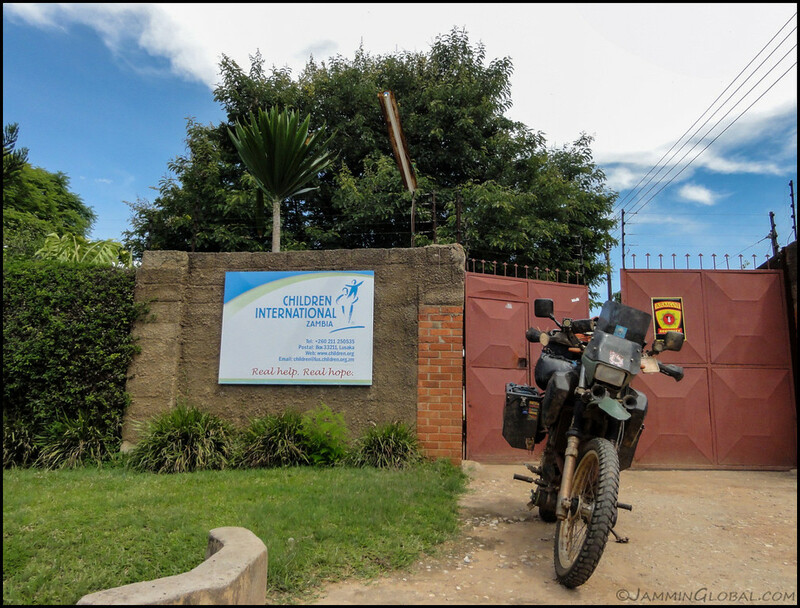 For sanDRina, Zambia doesn’t accept (or need) the carnet and customs simply issued a temporary import permit for free that I was to hand over when I left, which reminded me of the smooth border crossings in South America. Being politically stable meant that Zambia was on top of its bureaucracy and the customs agent made sure I bought insurance for sanDRina. 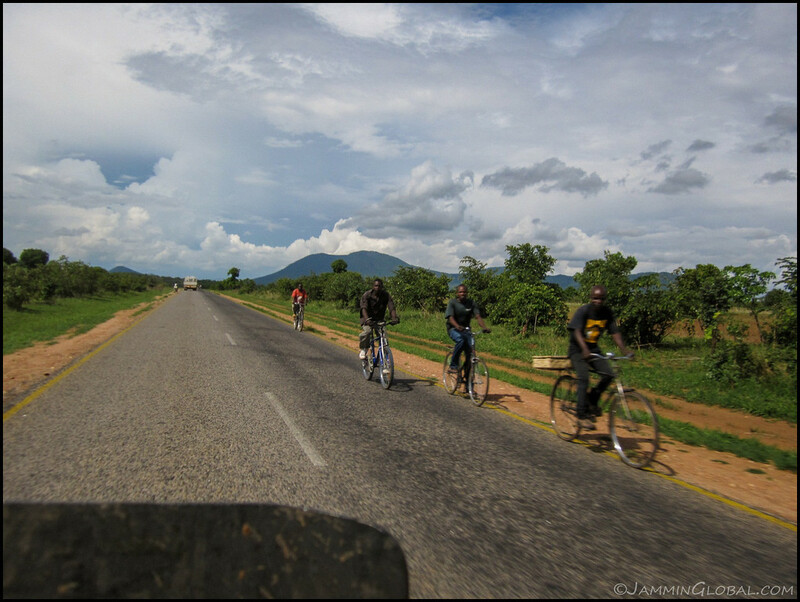 On the road to Katete with lots of bicycle traffic. 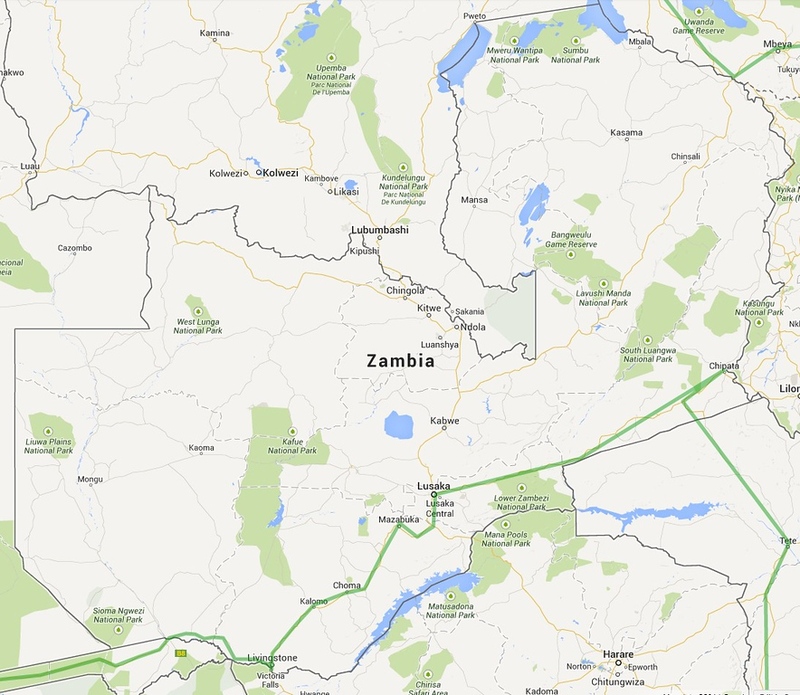 My route through Zambia. 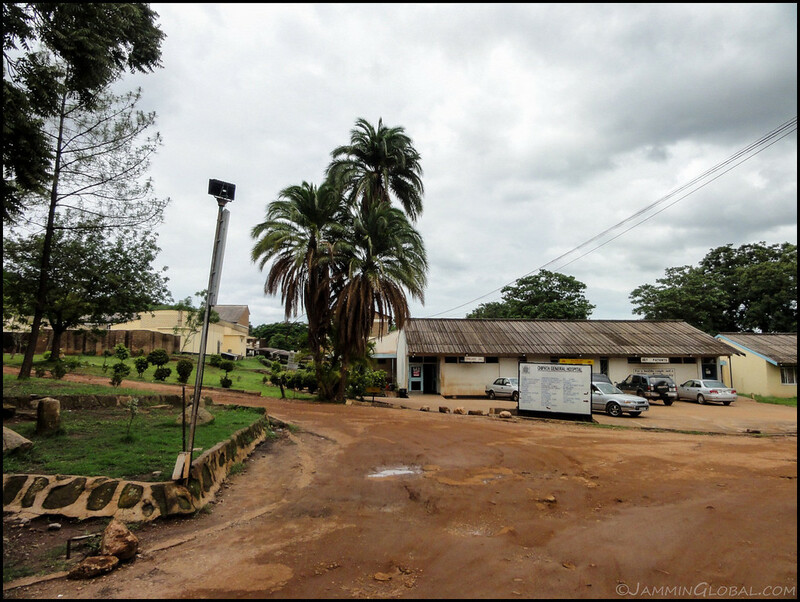 I entered from Mozambique then visited Chipata before heading for Lusaka and Livingstone. From there, I exited to Namibia. Click on it to go to the interactive version in Google Maps. 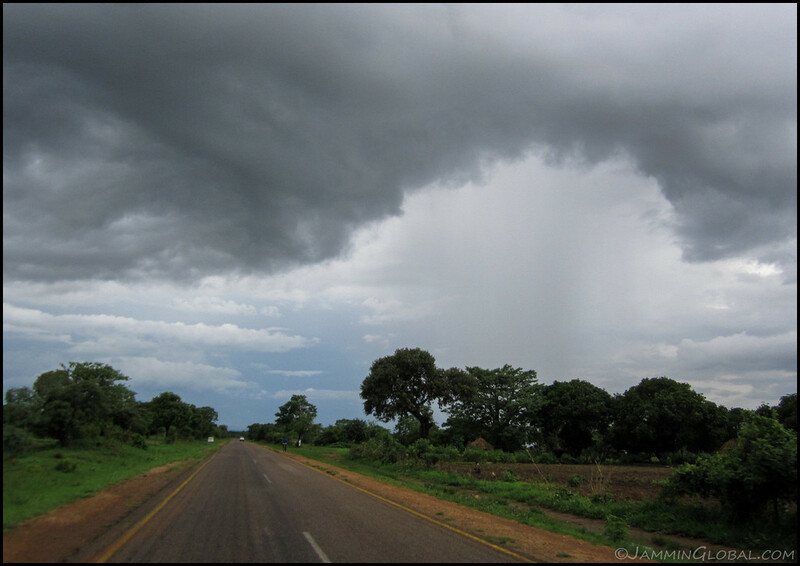 I was here right in the middle of the rainy season and was keeping an eye of this localized rain cell that eventually crossed my path as I neared Chipata. …I realized our old house had been turned in to a guest house! Oh wow, that meant I could sleep in my old house. I remember those massive roots as I would cycle over them. Back home!!! I was overcome with emotion to finally be back at my old house. I was so happy that it was still there and had not been demolished and was even happier to know that I could sleep in my old bedroom. I went inside and declared triumphantly to the young manager that this used to be my old house. 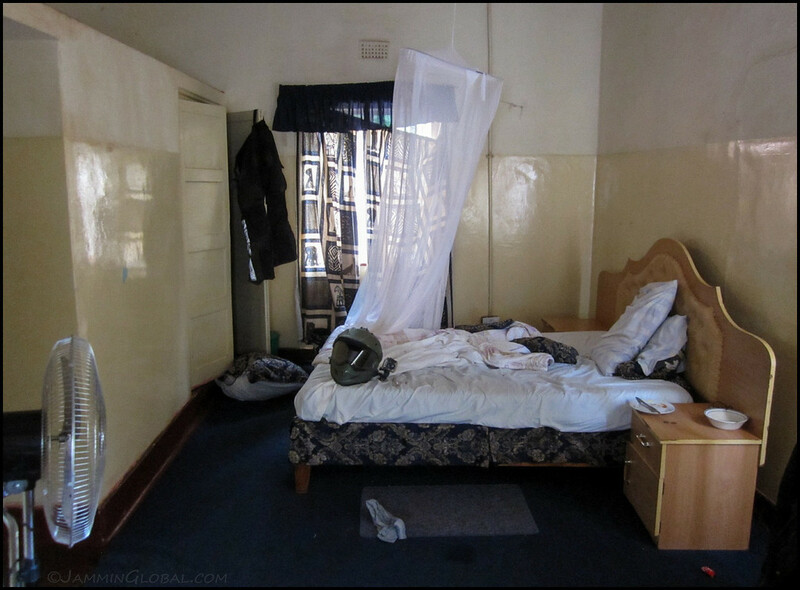 He said, great, you can stay in your old room for $25 a night. There was no discount for past residents. But anyways, I would have paid $100 or more to spend a night in my old house. This was different. The front porch used to be just the part on the left and they’ve constructed the extension on the right. I remember long afternoons of aunties and uncles playing card games out here and my father making me sit out here and read the encyclopedia, which I loved. The hallway from the living room, with my parent’s room on the left, guest room on the right and my sister’s and mine straight ahead. 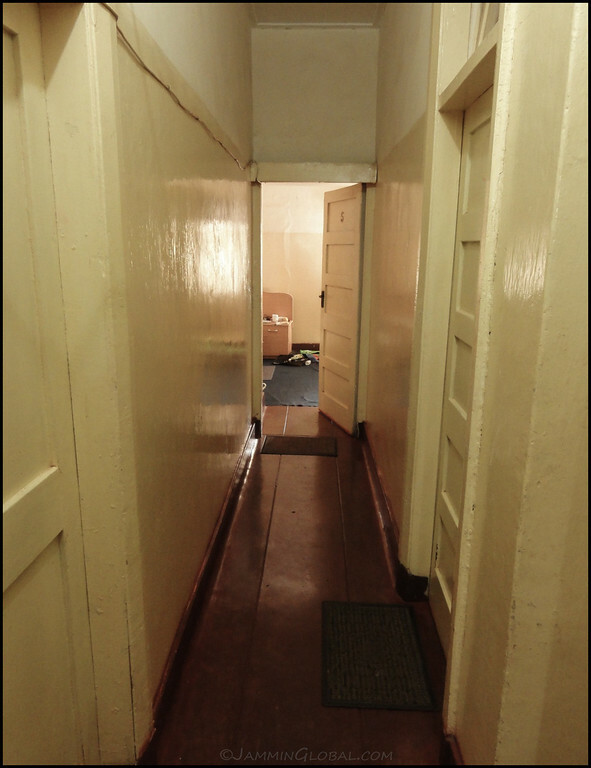 This corridor was so long in my memory as my little feet would run in the middle of the night, being scared of something to my parent’s room. Now, I covered it in just a few steps. My childhood room. Excuse the mess. 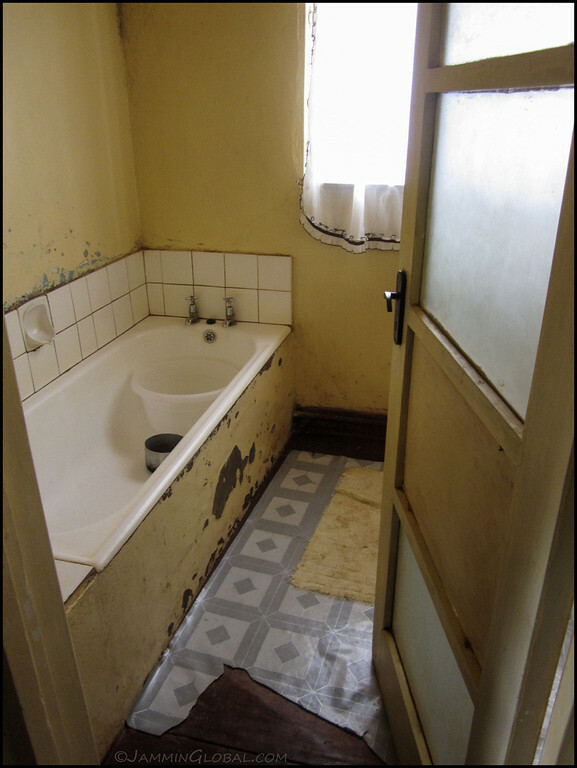 My old bathroom. Still the same. So many good memories of bubble baths. That evening the power went out and the manager said they couldn’t prepare dinner as the cooking range was electric. No problem for this overland traveler. 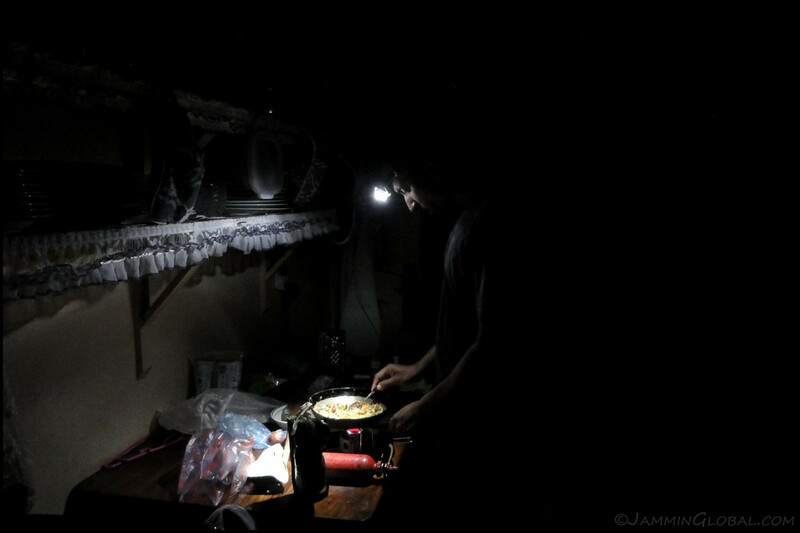 I set up my camping stove on the kitchen table, where I used to help my mom make cakes and lick the batter, and made a simple meal of egg-fried rice. 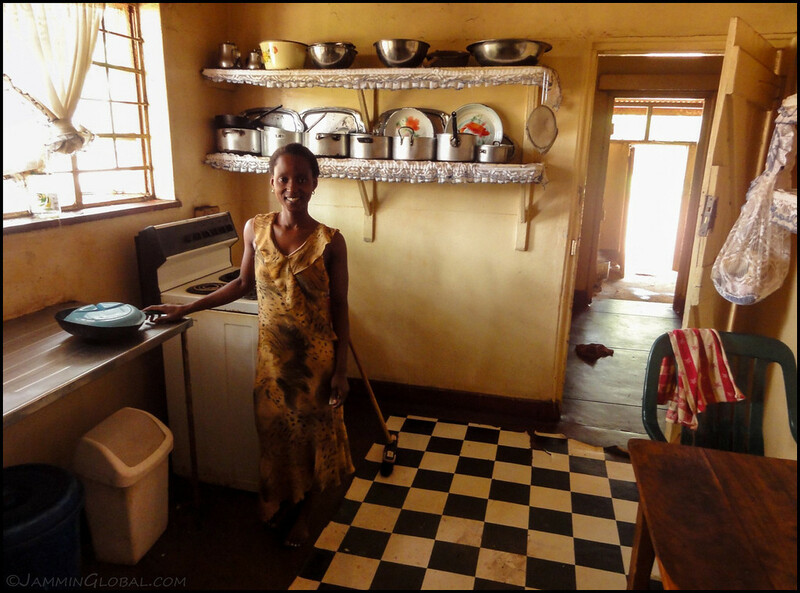 I cherished this moment, reveling in the thought that I was actually cooking in the kitchen that set me on a course to use my cooking skills to connect with people all over the world and here was was now, back where it started. The next day, I strolled through the golf course that was next to our house and remembered cycling all over the grounds and feeling the wind in my face, a precursor to my motorcycling life. 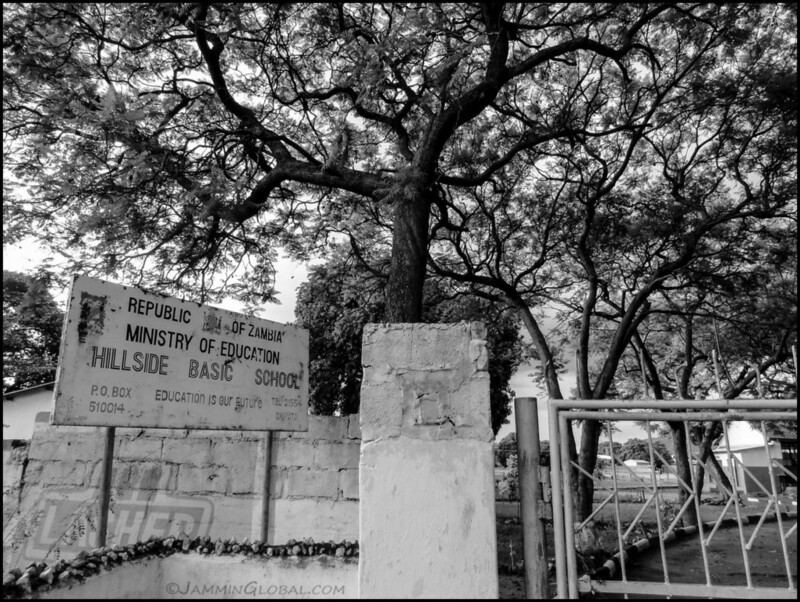 A bit further up the road and I came across Hillside Basic School. The first school I went to. 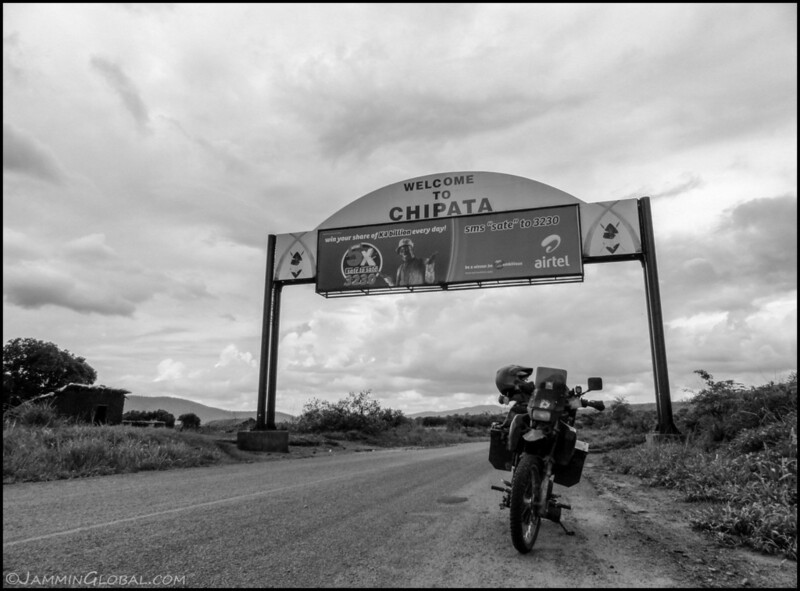 I left Chipata, traveled the world and now, I’m back. What a privilege to come back and visit such a deep part of my memory and know that it did happen and these are my roots. I was nomadic for the past few years and that nomadism brought me home, at least just for a visit. 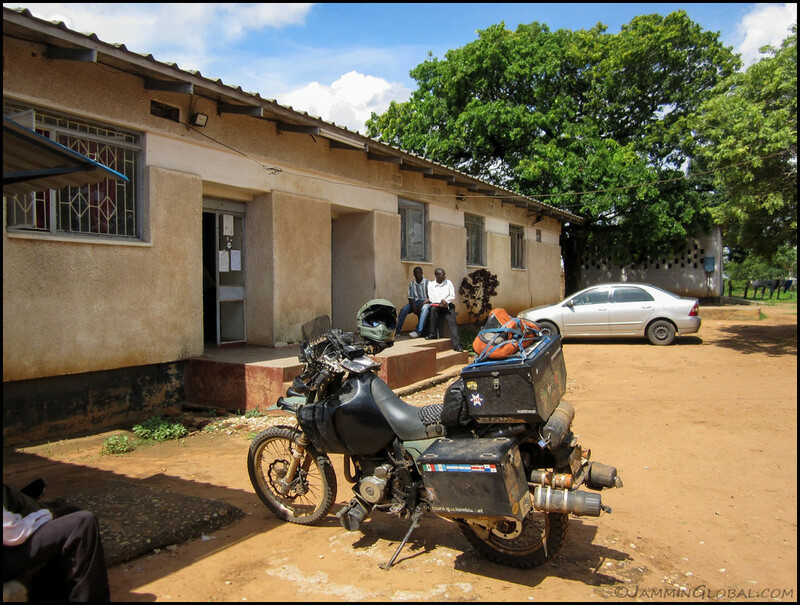 I walked down the road and came across the Chipata General Hospital where my mother and some of our close family friends used to work at. Walking around town and I saw these guys playing Checkers. 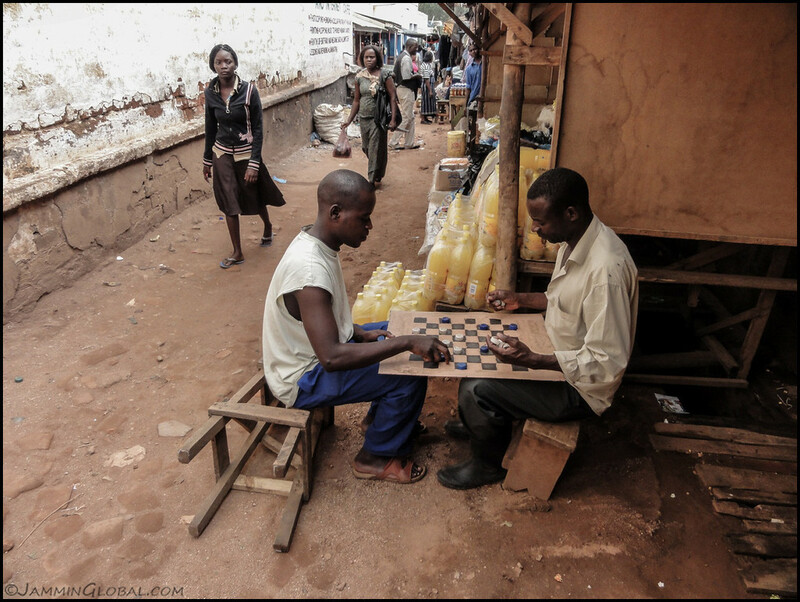 Just like most small towns in Africa that I’ve come across, there’s quite a passion for board games. 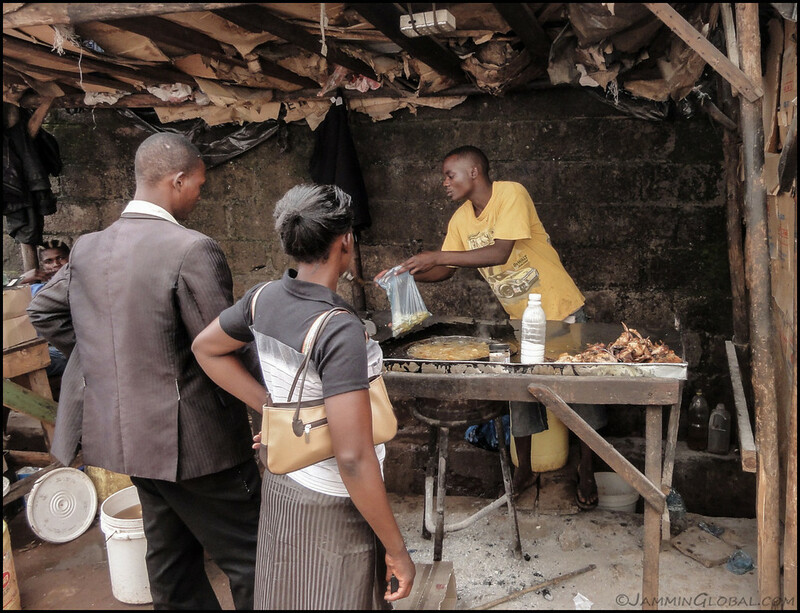 Getting a meal-to-go of fried chicken and french fries served in a plastic bag – proper African street style. 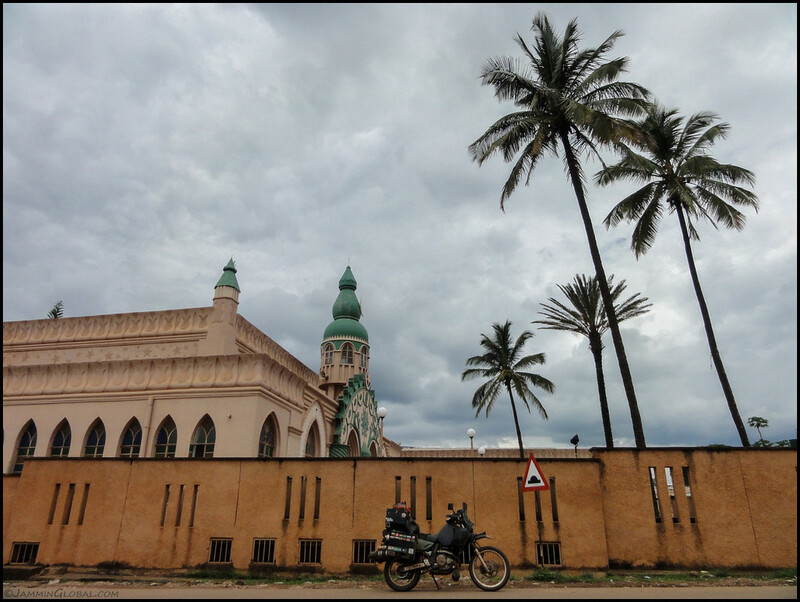 I took sanDRina for a spin around town and came across the old mosque and shops nearby where we used to buy provisions. At the old Barclays Bank at the main intersection of town. They wouldn’t let me take a picture of the bank, so from the bank, looking across at the petrol station that used to be a BP and the Great East Mall that now has many South African chain restaurants. I remember sitting in the bank, waiting on my dad, and staring out at the main road as big trucks from South Africa would roll in. Zambia and South Africa have a long connection as this area was first brought under British rule through the British South African Company, led by Cecil Rhodes, who was seeking the mineral wealth that sustains Zambia till this day. I was back in Zambia during an important moment in its history as the country rebased its currency. They were lobbing off three zeros for a number of reasons that included psychological confidence in the currency and making imports cheaper that the people depend on. During my time in Zambia, the Kwacha was a pretty strong currency as it was pegged to the dollar at 1.2 Kwacha. But in the late 80s and early 90s, poor policies were catching up with the country and high inflation set in. That was also when many long time resident expats moved out of Zambia, including my family. 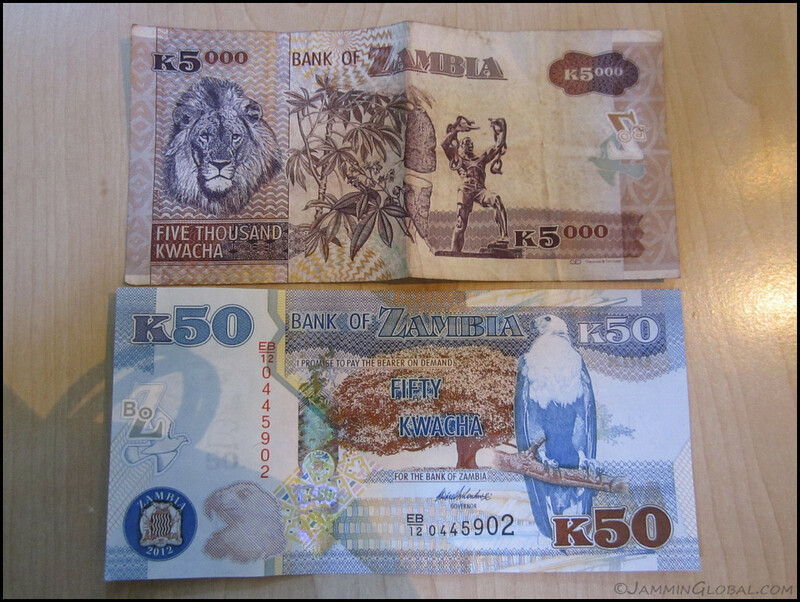 Now, when I arrived back in Zambia, the Old Kwacha was trading at 5,250 to the dollar. After the new year, it would be 5.25 to the dollar. 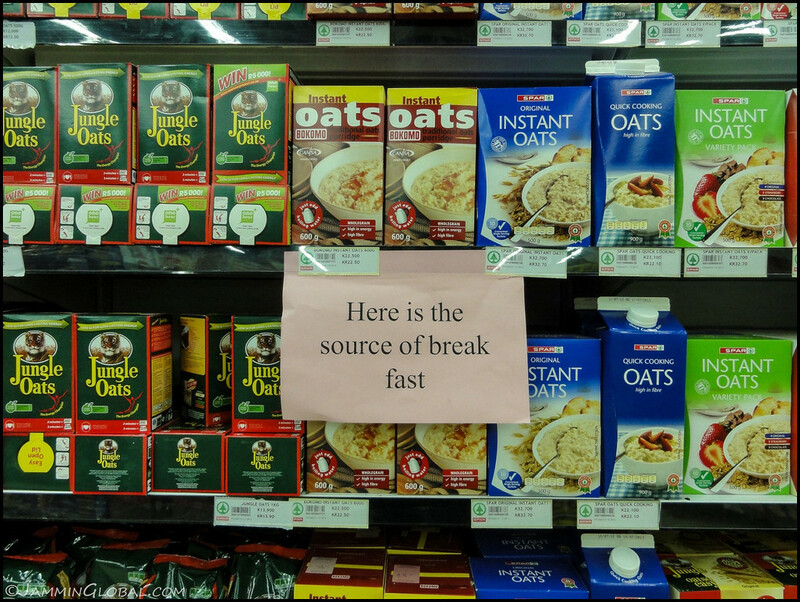 I strolled into the super market and being a lover of oats, I was happy to see this sign. From January 1, 2013, only the new prices were going to be accepted and until then, everything was quoted in Old Kwacha and New Kwacha. Sadly for Zambia, all these oats are imported from South Africa, which puts a strain on the economy. 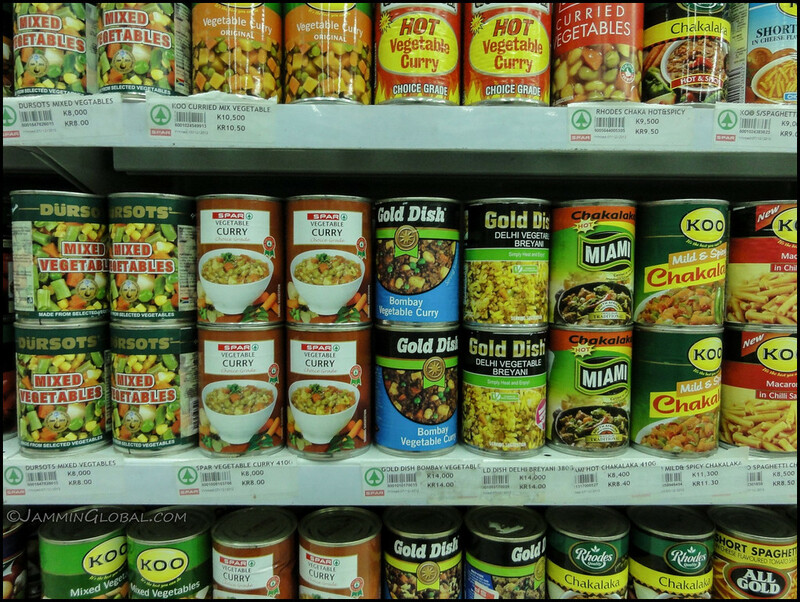 There weren’t that many Indians around but there was an amazing selection of canned Indian food. I had never seen Delhi Breyani in a can before now. I wasn’t tempted to try any of them. 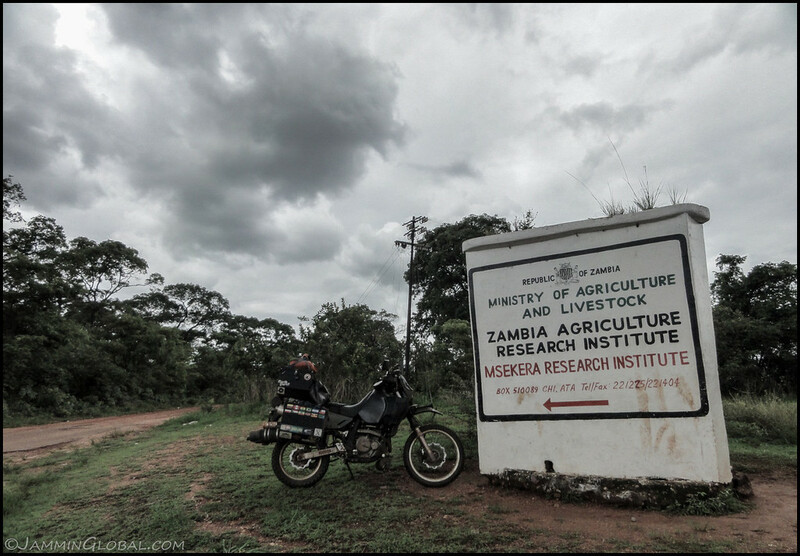 I rode a few kilometers out of town towards the Msekera Research Institute, where my dad was stationed at. I was also keeping an eye on those rain clouds. 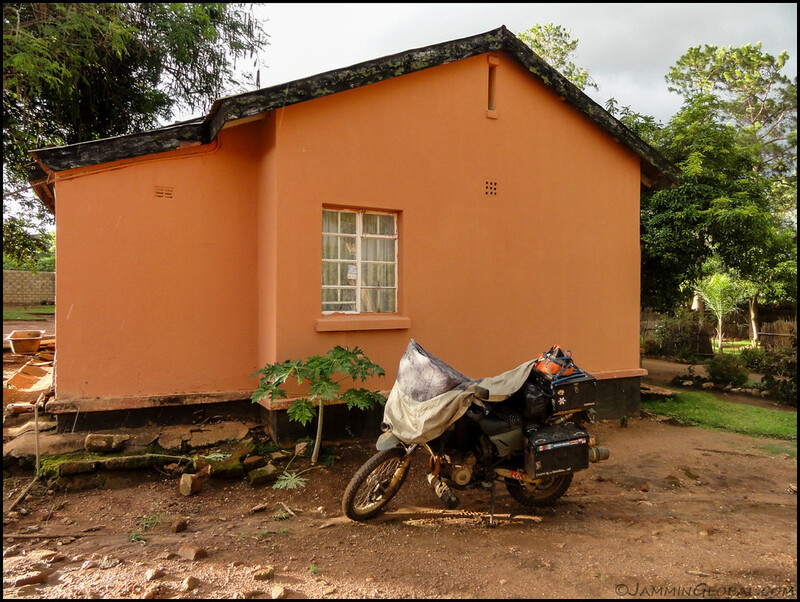 Visiting the first house that we lived in in Chipata, which was next to the research station. There was no one around, so I wandered around for a bit and absorbed the flood of memories coming back. 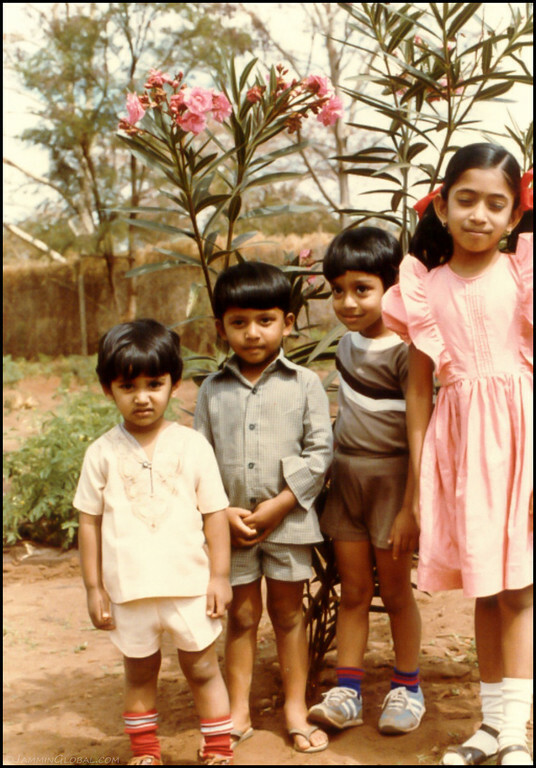 Flashback photo: My sister, Lavanya, and close childhood friends of Deepak and Kiran in the garden of that first house. We look so 1980s. I wonder why Deepak’s stepping on my foot? A nice coincidence is that Deepak and I share the same birthday, but he’s a year older. There were always two birthday parties that day. Both their parents were doctors at the same hospital that my mother was at and I remember the immunization policies that all the families adhered to. Namely that if any kid got a childhood disease, such as measles, mumps or chicken pox, there was a sleepover at the infected kid’s house so that all the kids got the disease, got over it together and built a strong immune system when it doesn’t hurt the body much. Some people in the West might think it’s crazy to voluntarily subject your kid to a disease but it’s much smarter to get those diseases as a child rather than as an adult when it’s much more serious. Interestingly, besides me, everyone else in that photo is now a doctor. Looking down the rough road from that first house to the research station and the main road. 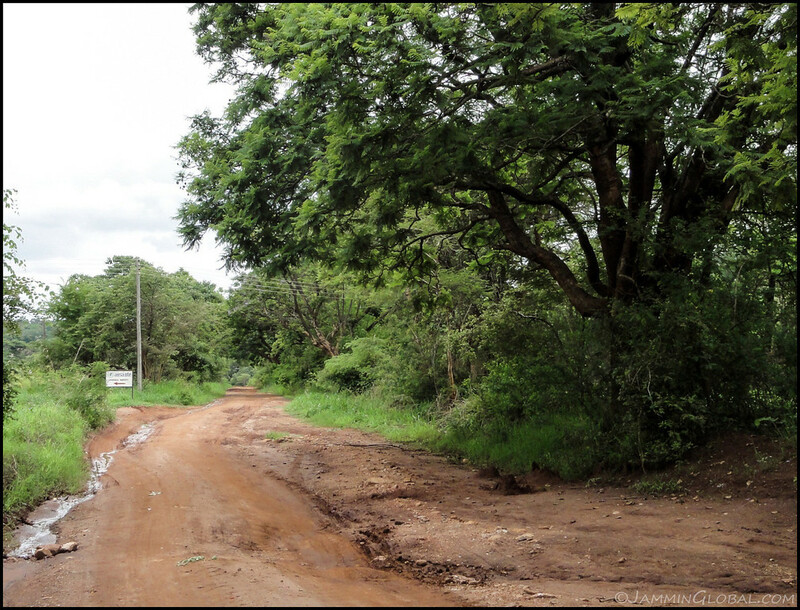 I remember bouncing along on this road in our standard issue Toyota Land Cruiser FJ45. 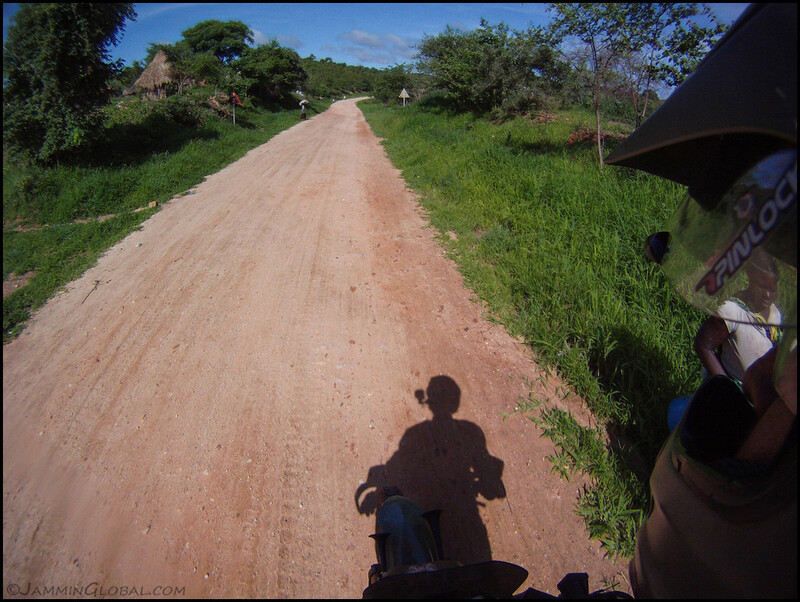 And now, I was riding down this same road on a Suzuki DR650 that I was riding through Africa. I soaked in the moment and GoPro’d it. 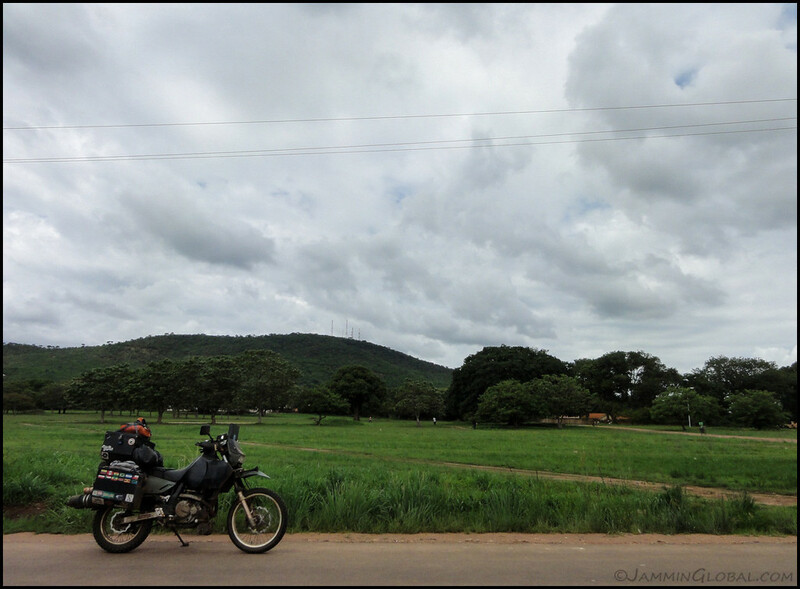 I rode through town and continued on towards the border with Malawi. This was a special moment as this was the place that connected music and being on the road for me. 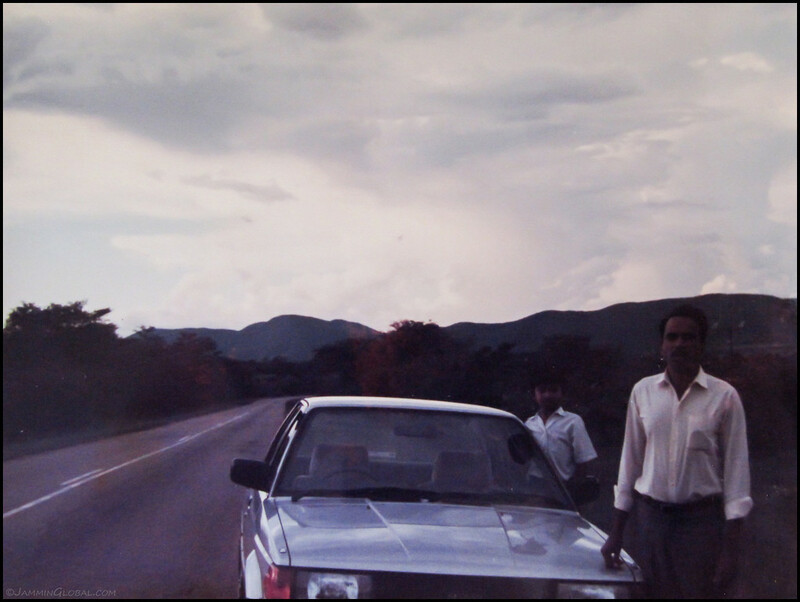 Flashback photo: My dad taking us for a drive in our Nissan Bluebird on the road to Malawi. Many an evening we used to get in the Bluebird and just go for a drive. My dad enjoyed listening to music while driving and he would ask me to identify all the different instruments and that taught me to pay attention to music ever since. Jammin – it goes back to these moments. I got back to town and I was checking out the condition of the houses of my childhood friends and as I turned the corner, I saw these ominous rain clouds sweeping in fast. It’s so awesome to say that I ran home for safety. I made it home as the rain hit and just like back in the day, I’m enjoying the rain from the big windows of home. These storms are just as intense as I remember them. They sweep in fast in the afternoon and are finished within half an hour. Hey, guava tree, nice to see you’re still holding it down. And the best part about fast moving rain is that it leaves behind clear skies. Our house was an old colonial house when we lived there and thanks to being bought by these motel owners, it’s got a secure future. This fence wasn’t there to the garden and I remember learning to cycle around the huge front lawn and having my first skinned-knee here. 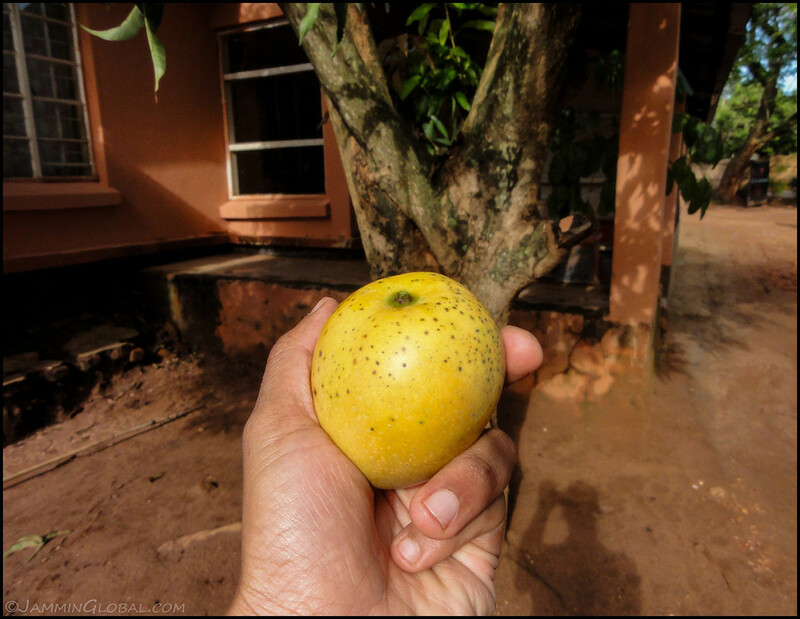 A fresh mango from this mango tree that’s been at the house entrance even before my time. It tasted especially delicious. 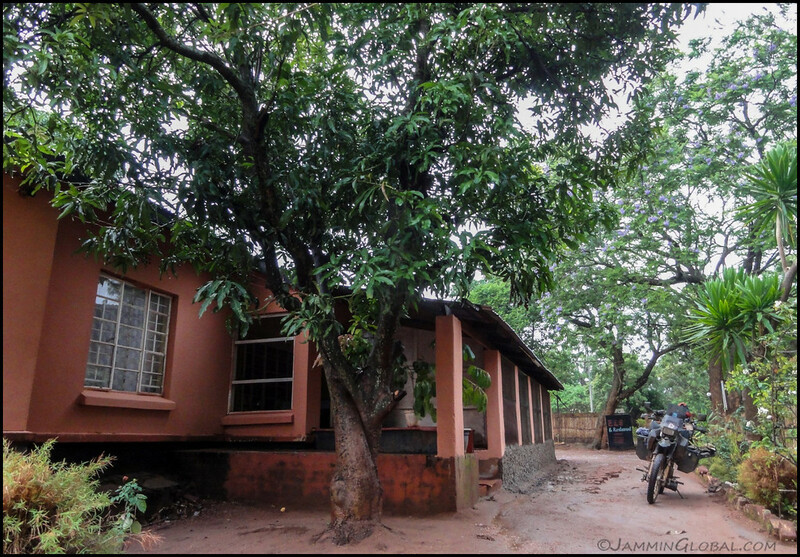 I couldn’t get over the feeling of just staring out of my old bedroom window and seeing this giant motorcycle parked outside and knowing that I had ridden it from my most current home in Chicago to this old home of Chipata and onwards to another home in Chennai. 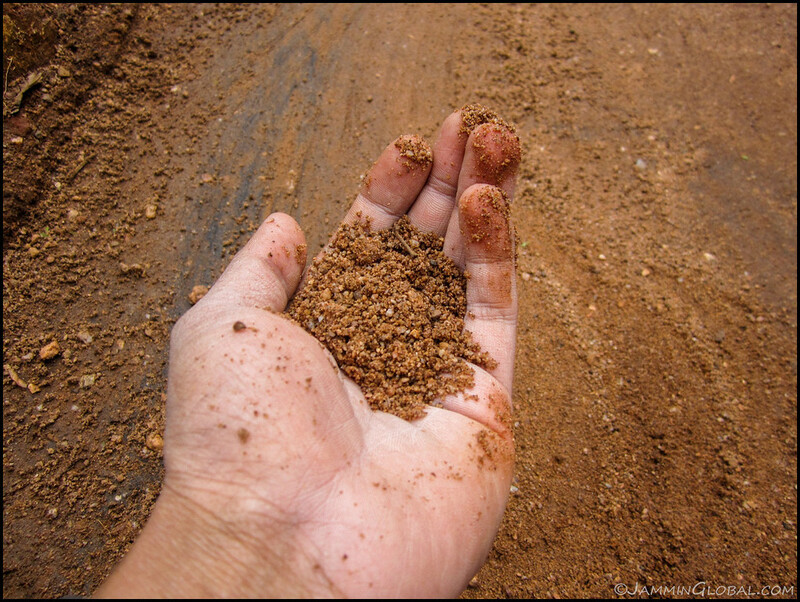 sanDRina, you connect all my homes and of course, you’re my home on the road. It was time to leave and I said bye to the motel maid in our old kitchen. 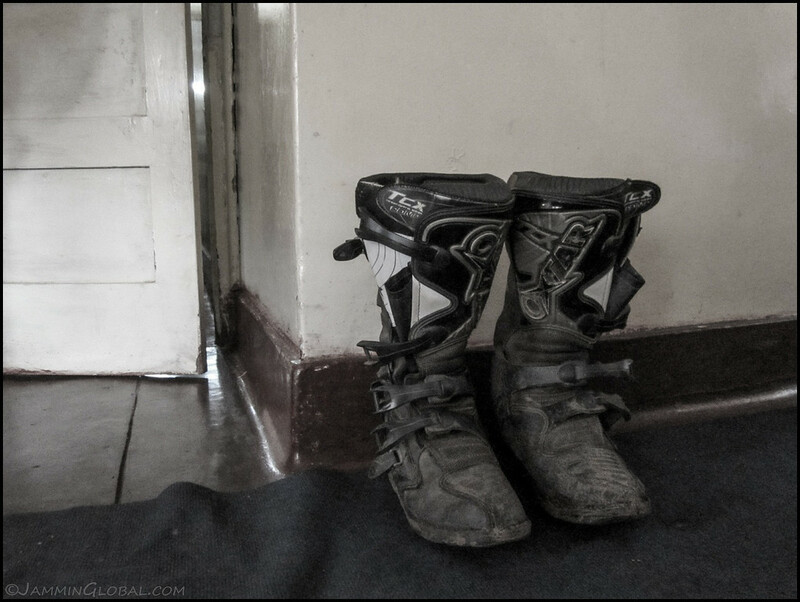 Putting on my muddy boots in my old bedroom. Goodbye old bedroom. One last moment of reflection on the front steps of the house. Goodbye, old house. It’s been fantastic to come back and touch deep memories of my early childhood. I’ll be back. sanDRina and the Chipata Golf Course. From bicycle to motorcycle. Onwards!